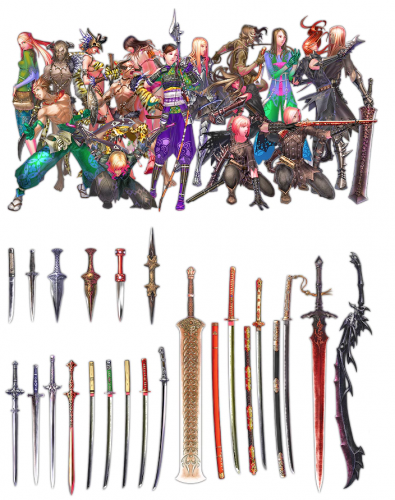 This week, I look at three amazing RPG Kickstarters. One for kids, one for 5e, and one with vibrant art that fits the angelic theme. Let’s count them down. Ends on Saturday, September 9 2017 8:18 AM EDT. “A Role-playing game for adults to play with kids. Simple and engaging. Gauntlets & Goblins is the result of my nephew’s desire to play the kind of games that mommy, daddy, and his uncle played. I took the concepts of conventional RPGs and boiled them down to the absolute simplest form. As a result, G&G has all the essence of a full fledged experience in a package that a six year old can understand. Gameplay: We use cards and symbols to make the game as manageable as possible for young players. Dice mechanics are simple, roll a set amount and count your successes. 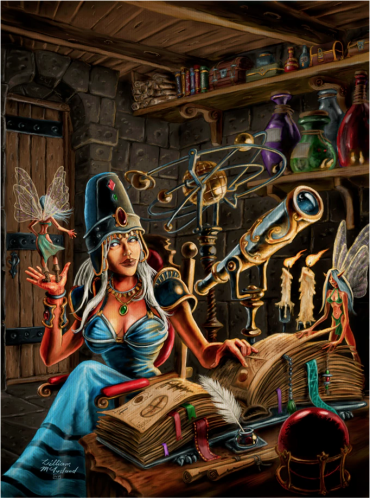 Spellcasting is a breeze with easy to grasp, conceptual spells like fly, enlarge, or disguise. Combat is engaging and exciting, but not overly threatening. If you run out of heart cards, you just fall down until it’s over. Four character classes, warrior, thief, mage, and cleric. Each with their own strengths and weaknesses. Equipment cards of three quality levels. Swords, spell books, holy symbols and more. Magic item cards to enhance your adventuring experience. Spell cards that grant you magic that can be used as much as you like. You will work with us to create a magic item card for inclusion with the game. See the FAQ for guidelines. 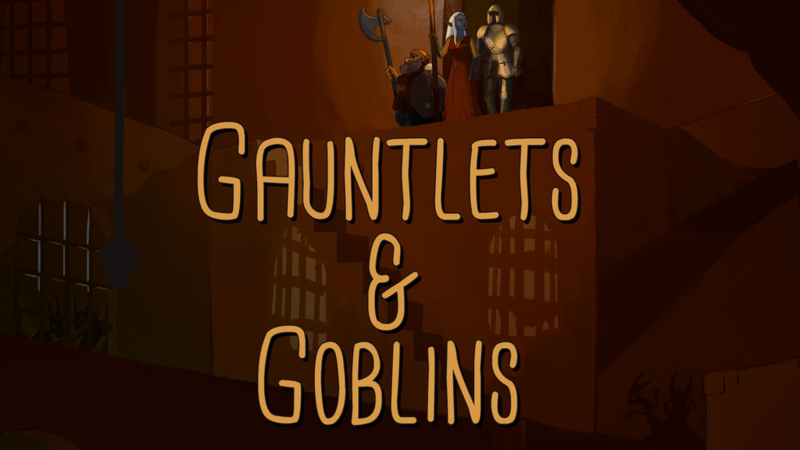 Gauntlets and Goblins is an all-ages RPG on Kickstarter with an option to create content for the game. Why am I sold? Because I write all-ages game reviews at EN World and I review RPG Kickstarters with wanna-lancer* rewards right here. This is the crossroads of “journalist” Egg and wanna-lancer Egg. Getting to design for an all-ages game would be awesome! Need more details? Try Dan Davenport’s Q&A with Ian Gibson of G&G here. You can find the playtest for G&G here. This is worth checking out! 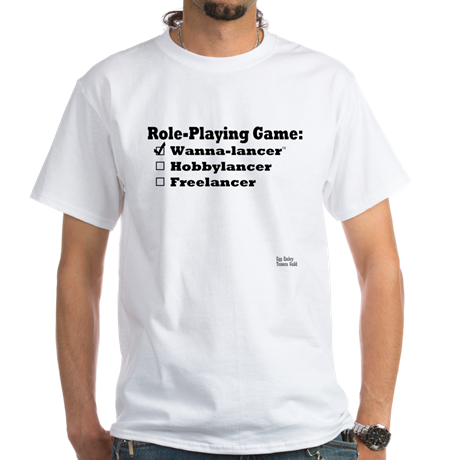 *Wanna-lancer™ – A gamer that’s pursuing freelance RPG work. Some back RPG Kickstarters that offer rewards to create NPCs, spells, items, adventures, etc. in order to build up their resume, make contact with publishers, and learn what’s expected on assignments. Ends on Sun, September 10 2017 12:33 AM EDT. 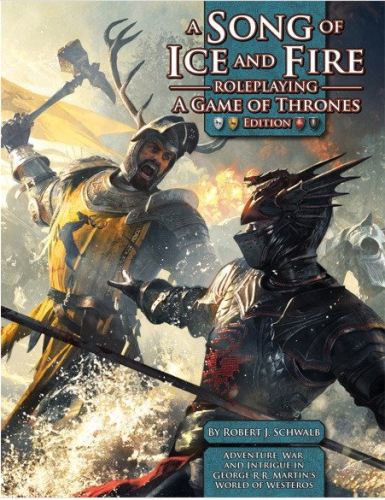 “Adventures worth winning for Fifth Edition, Swords and Wizardry, and Pathfinder. 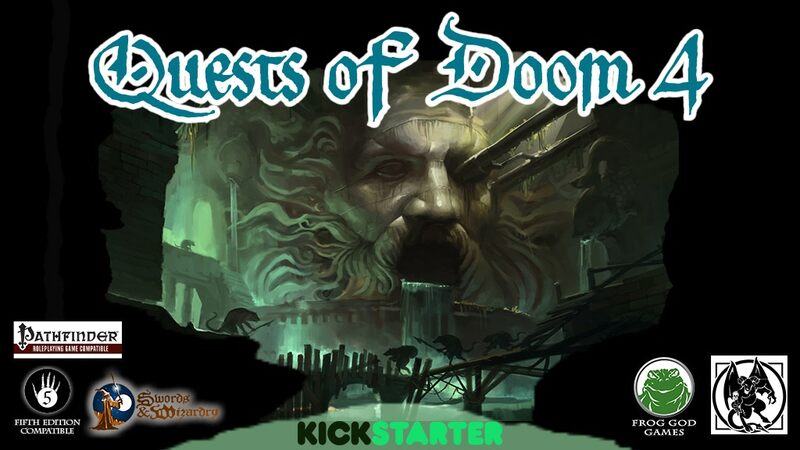 Frog God Games wants your help in bringing to life 16 exciting and challenging adventure modules in the Quests of Doom series. 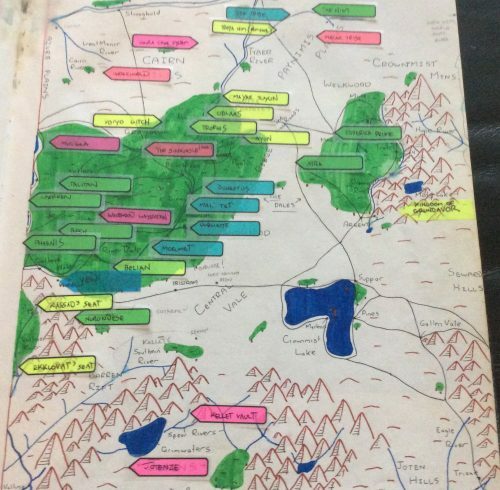 Each adventure is already written and converted, and the maps and art are paid for – they only need to go through layout. After layout, they need to be printed, which is where you all come in! Fifth edition rules, first edition feel; FGG lives that ethos. It’s Frog God Games, you can’t go wrong. Their work and track record speaks for itself. If you have not experienced it, instead of reading my thoughts, try some of their work like the Sword and Wizardry Complete Rulebook at a suggested PWYW of $0.00 here. After you read that, it will make backing this 5e, Pathfinder, or Swords and Wizardry Kickstarter campaign an easy choice. 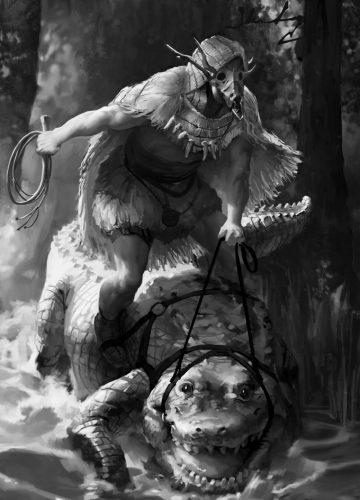 You can see examples of Frog God Games work at DriveThruRPG here. Ends on Sunday, September 10 2017 1:59 AM EDT. “The City of Seven Seraphs is a fully developed Planar Metropolis for the Pathfinder RPG available in full-color Hardcover and PDF. The City of Seven Seraphs is a Campaign Capstone sourcebook for the Pathfinder Roleplaying Game©. Inspired by epic adventures in the Planes of the 2nd Edtion of the World’s Oldest Fantasy RPG, The City of Seven Seraphs will bring a home to planar adventure for the Pathfinder gaming community and infuse existing campaigns with a new level of otherworldly reality. New Base Classes: The book contains new base classes, the Nexus, a veilweaving class which gains the ability to take on the mantles of various outsiders to allow PCs to gain the powers of the Planes, and the Shadewalker a traveler of the dark roads between. Could there be more? We seem awfully fond of 7s. 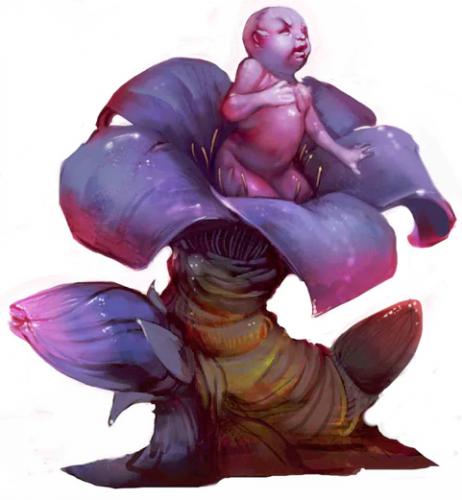 New Races and fresh takes OGL Classic Races: New races like the judow, and inevitable-spawn people influenced by kyton or the a fresh-look at the ceptu (from Epidemic Books Oathbound: Seven) a races of telekinetic invertibrates! N. Jolly (Racial Design and Planar Mechanics): “N. Jolly is widely regarded as a hero by most, having been involved in numerous successful kickstarter projects including the Forest Kingdom Campaign Compendium and Spheres of Might. Known for his skill with mechanics as well as flavor, he’s a well seasoned writer who brings his own unique flair to this project in order to make sure it turns out ehncredible.” Patreon link. This art! It’s Pathfinder, it’s an interesting concept, but it’s Vincent Coviello’s art that pushes it over the top! Follow the link and check it out, it’s worth taking a peak just to see Vincent’s artistic skills. Also, N. Jolly is contributing to this project. I’m shouting him out for no reasons other than he’s a nice dude and his work on this product is going to help knock it out of the park and it leads to my signal boost below. You can see examples of Lost Spheres Publishing work at DriveThruRPG here. 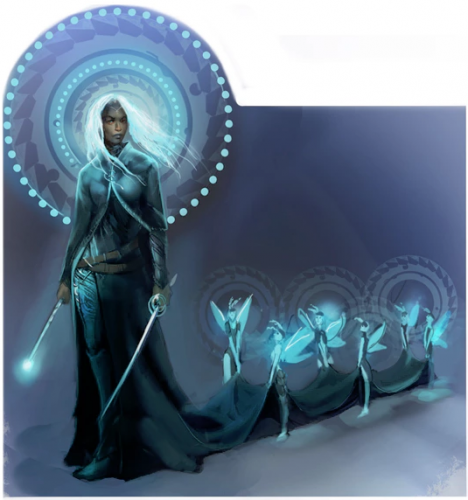 Art from the City of Seven Seraphs… I mean, come on! This is soooooo nice looking! Let’s bridge to this first signal boost by mentioning that N. Jolly (from City of Seven Seraphs above) is working on Modern Adventures. Modern Adventures Tabletop RPG – Take up sword and gun to seek fame and fortune in this gritty fantasy game set in modern-day Earth. For the Pathfinder RPG system. From Higher Grounds Publishing. Read more about N. Jolly on this project here. 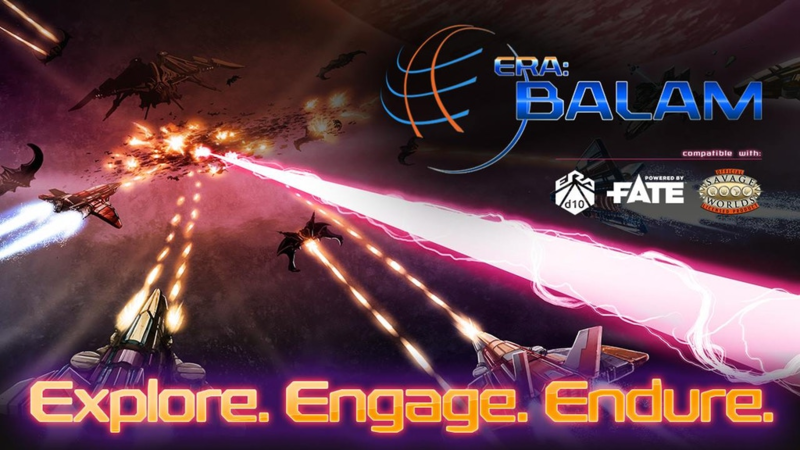 Jump in your Starfighter for Era: Balam – A Project Of Earth – Explore a solar system and defend Humanity from an alien fleet! Era: Balam runs on your choice of Era d10, FATE or Savage Worlds! From Shades of Vengeance. 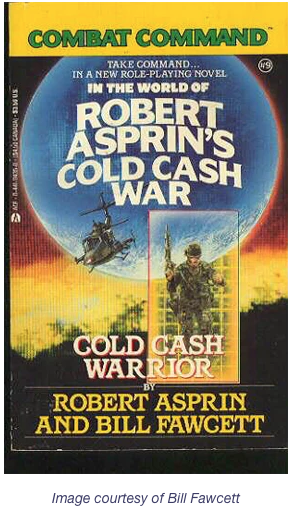 Robert Asprin’s The Cold Cash War – A role playing game setting, for the Savage Worlds and Cepheus System, based on Robert Asprin’s The Cold Cash War. From Battlefield Press, Inc. Sometimes (all of the time), wanna-lancing is about gaining the experience needed to become a tabletop RPG freelancer. Other times, it’s about meeting people in the industry. This week, I look at crowdfundings that offer one of each scenario. Kickstarter campaign ends on Monday, June 12 2017 8:47 AM EDT. 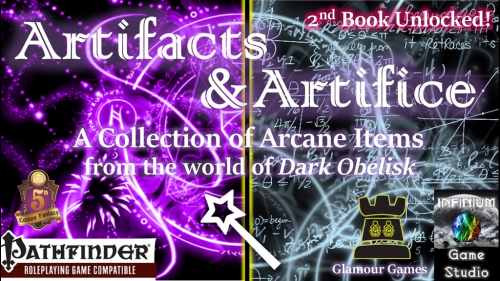 “200+pp color PDF/hardcover with a wealth of magical items, each with quests, backstory, NPCs, and integration with the Dark Obelisk AP. If you play Pathfinder or 5E/Fifth Edition, this book will be valuable to you. On the fence? Check out the sample magical item, Abhorrent Naginata, available for free only during this KS campaign. 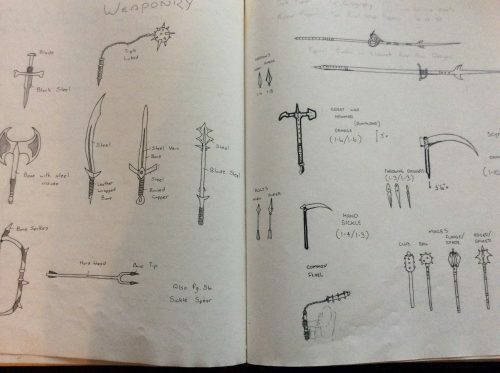 It’s 10 pages of lavishly-detailed goodness, all dedicated to a single, nifty magic weapon. It’s a good example of what to expect… times dozens of items! 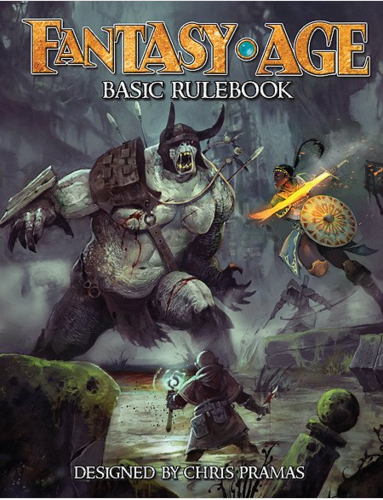 This product is a massive, 200+ page full-color PDF and hardcover roleplaying supplement that will enhance any Pathfinder or 5E campaign in any setting. Infinium Game Studios is offering a free sample of the type of product that they’re developing through this Kickstarter. If you need major items for your campaign along with detailed backstories, related NPCs, and adventures, this has got you covered. 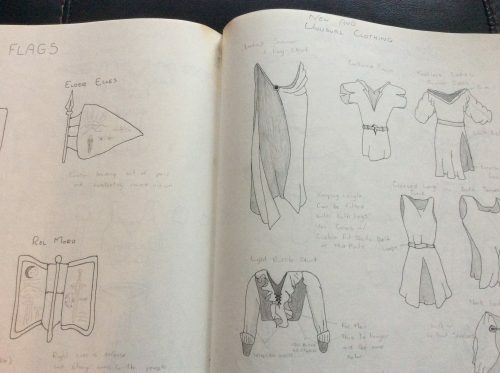 Add to it, you can design a NPC related to one of those items or a magic item to appear in one of their two books or you can design both and an adventure. Lots of vanity press options. For these books, they’re a good mix of RPG crunch and wanna-lancing opportunity. IndieGoGo (originally on GoFundMe) campaign ends on Saturday, June 17 2017. Jamie Chambers wrote more on his GoFundMe page [UPDATED – This has moved from GoFundMe to IndieGoGo here. The GoFundMe total counts toward the overall total] detailing the experience of/reason for writing this adventure, not so much about the adventure itself. Let’s assume it’s a good dungeon crawl for 5e and it’s worth entertaining a quick inspection of it and its crowdfunding campaign. From a wanna-lancing point of view, this campaign offers the opportunity to help craft a NPC and/or playtest the product with the creator. This offers the potential for face-to-face contact instead of everything between you and an established pro being type, type, type, type, type, type, and more type. For Egg, there’s one additional opportunity here. While looking up Jamie Chambers, it turns out he lives a town or two away from where my humble home. One of the challenges of any type of entertainment freelancing is location. Live too far from where the wider professional community sits and you’re dependent on computer and phone contacts. Face-to-face causes some professionals/editors/publishers to become more invested in you as a person and creator. Human contact and all. For my end, I live in Georgia, which has taken on a degree of prominence in the TV production world. But, for many other creative endeavors, it’s pretty far from where the action’s at. The potential to meet a local creator to network with is an opportunity to break out my rusty speaking skills instead of typing… Always typing. Will Jamie want to meet me? That’s CLEARLY not part of the crowdfunding campaign so I have no illusions that he’s dying to meet a dude named Egg. Heck, he’s not too far away, he may know some Embry’s and be feeling Hatfield toward McCoy, you know. Still, an interesting possibility of an “extra”. When looking at wanna-lancer opportunities, this is a bonus. The potential to meet someone in the industry outside of a convention is worth looking into. My Tessera Guild-mate, Robert (Route 3) Jeffrey II, is still running his Kickstarter as is my friend and publisher, Michael (Grond) Phillips. I cannot recommend checking out these Kickstarters enough! Ever want to role-play a western? Want to make your 5e fighters even more lethal? 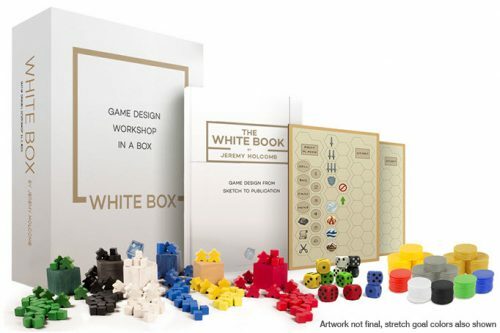 Got a board game idea and you just need the pieces to get it started? If that’s the case, Kickstarter has a game and two game aids that end by Wednesday May 24th that are begging for your attention! The countdown is on! Ends on Wednesday, May 17 2017 9:00 PM EDT. Who wants to build a better board game? Or any board game? Need the components and some pointers from the professionals? The White Box is the product for you. Get the parts you need to build your game, a book of professional essays on the subject of game-making, and make it happen! My write up of this product is here and the link to the Kickstarter campaign is here. Ends on Monday, May 22 2017 12:59 AM EDT. Want to make your 5e fighter the best they can be? Want to use ideas from a company called Total Party Kill Games that strives to live up to their name? 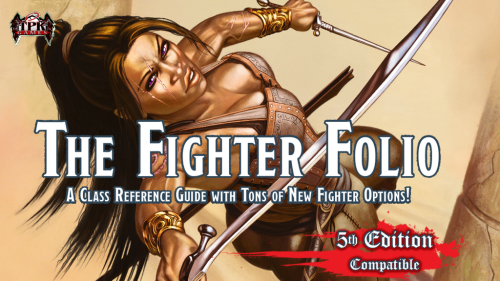 The Fifth Edition Fighter Folio & Condition Cards are for you! I am proud that I had the chance to contribute some ideas to this product and I can’t wait to read them in print! My write up of the folio is here and the campaign is here. Ends on Wednesday, May 24 2017 12:00 AM EDT. Want to role-play in an alternate history wild west? 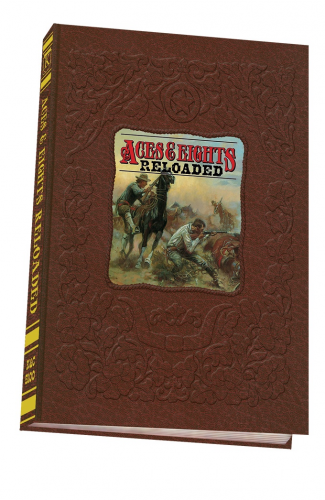 Want to “relive the glory days of the ‘West that never was’?” Aces & Eights: Reloaded is the second edition and 10th anniversary edition “of the world’s best selling, state-of-the-art, game-of-the-year wild west role playing game”. This isn’t just the game of western shootouts, this is the game of the 1800s with all professions open to you. This is the game could answer how the west was won. 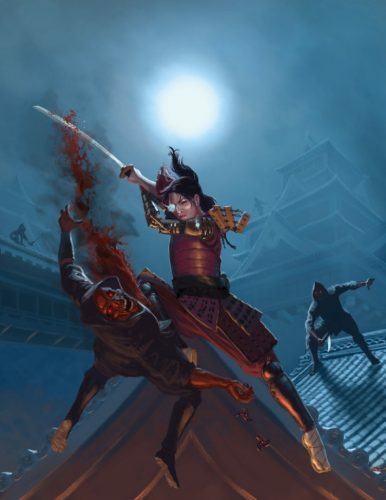 For those looking to add a wanna-lancer, vanity press RPG credit to their resume, this campaign has several options to immortalize your NPC in a supplement or the main book. You can create an original Woman With No Name and have her live out countless stories across the wild west from the tabletops of gamers everywhere. You can reach the Kickstarter campaign here. Two weeks ago, I discussed picking up a RPG playtester resume credit from Kobold Press’ Tome of Beasts and Book of Lairs Kickstarter. 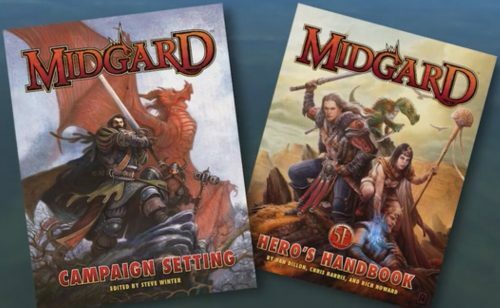 This week, I’m looking at Kobold Press’ 5e campaign setting, Midgard, the early access to playtest materials that they’re offering, and their stretch goal that will open this campaign setting up to let anyone write and publish in it. Kickstarter campaign ends on Friday February248th, 2017 at 4:00 PM EST. “Five years have passed; high time to update the Midgard Campaign Setting, and add Deep Magic, adventures, and player options galore! Welcome to Midgard’s shadow roads, traveler! The way is winding and dangerous, but the rewards are great for the adventuresome and bold. Midgard Campaign Setting for 5th Edition and Pathfinder RPG: A 300+ page volume describing the Midgard regions, from the Northlands to the Western Wastes, and from the Southlands to the Crossroads. With detailed locations, cities, rulers, heraldry, plots, and adventure hooks galore, plus full details of the various pantheons, masked gods, and dark gods, there’s enough here to fuel years of adventuring! In this updated edition, you’ll get the expanded Blood Kingdom of Morgau and updates to Zobeck, the Cantons, the Western Wastes, and other regions. If we meet our goals, we’ll also add the Shadow Realm and Blood Kingdom as standalone chapters, and may even open the golden gates of Khandiria… It’s a rich and standalone edition of the setting. This book is available in both a regular cover and in a special limited edition with leatherette cover, bookmark, and stamped gold foil, plus a handbound leather edition. 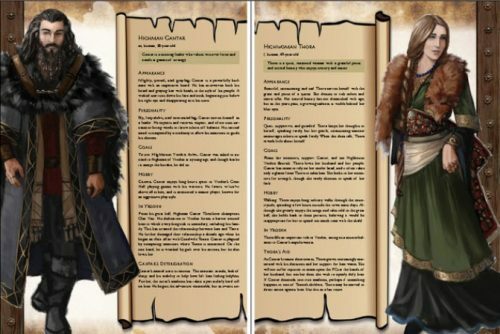 Midgard Heroes Handbook for 5th Edition: Full details for Midgard races, variants, archetypes, and backgrounds—everything you need to play trollkin, ravenfolk, kobolds, and others! You’ll also get more than a dozen new cleric domains, new weapons and equipment, and Deep Magic spells and traditions such as Clockwork Magic and Ley Line Magic. Stretch goals will add even more Deep Magic to the book, plus expanded races and broader options for existing ones. 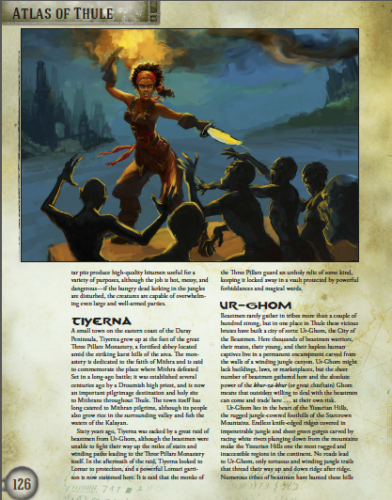 Midgard Player’s Guide for Pathfinder RPG: Collects all of Midgard’s racial lore, class options, feats, and equipment under one set of covers—plus new material for ley line magic, and more. We hope to expand it with shadow magic and other stretch goals. Developed by Paizo staff developer Amanda Hamon Kunz. 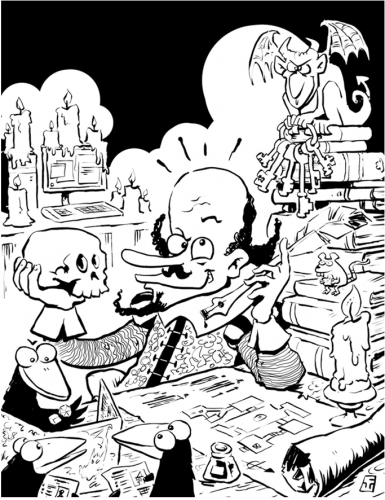 Eldritch Lairs: A series of short 5th Edition adventures written by James Haeck and other designers, somewhat like the Prepared! collection of one-shots. This starts as a set of PDF stretch goals, and it will become a print volume included with the premium tiers once the collection is big enough (it will be an add-on for Basic pledge tiers). 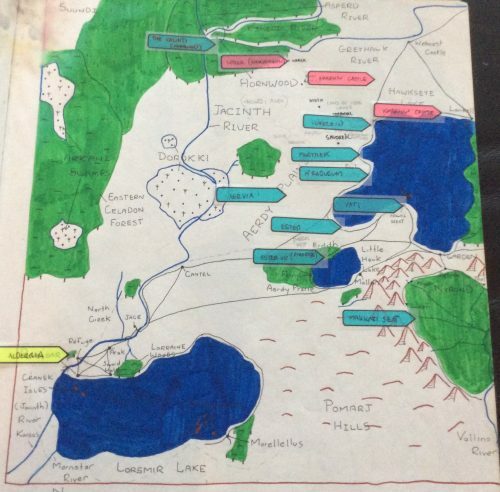 From the earliest days, the Midgard Campaign Setting has been an open world: pre-Kickstarter, patrons brainstormed elements of Zobeck, the Margreve Forest, and the horrors hidden beneath the Ironcrag Mountains. Over the years we’ve kept that door open, with an open freelance submissions policy and frequent design contests to bring new talent into the field. Well, now we’re taking a big step beyond that. If we get enough backers on this Kickstarter, we’ll launch Midgard as an Open World on DriveThruRPG and RPGNow. 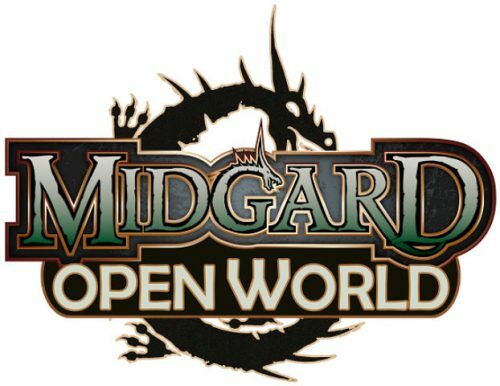 What will it mean for Midgard to become an Open World? Glad you asked! 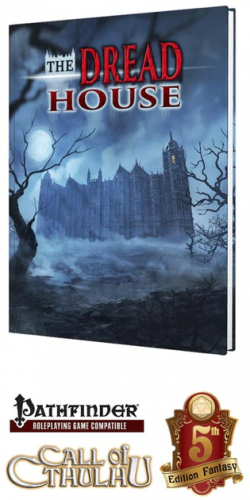 Like the Forgotten Realms and Ravenloft in the DM’s Guild program, Midgard will be open for anyone to use and publish locations, adventures, characters, lairs or other playable material (under certain conditions). In this case, it would cover supplements that are compatible with 5th Edition, Pathfinder RPG, and 13th Age RPG. How close are we to that goal? We need 2,000 backers to form a strong enough nucleus of new designers to attempt it; we’re currently at just over 1,000 backers, with a little more than 2 weeks left. That means we definitely need your help to make it happen. It’s possible, but it’s not a slam-dunk. What gets us there? Every backer of the project counts toward this goal, regardless of dollars pledged or rewards chosen. That means if all 4 players in your local game pledges $1, we’re 4 backers closer to the Midgard Open World. Any and all of those backers get first peek at Backer Updates in this project, which might also inspire them to roll up some homebrew encounters or build out that archetype they’re always talking about. It’s up to them. I’m building a RPG resume by purchasing creator opportunities on Kickstarter. This Kickstarter has pledge levels that offer early access to playtest materials for one of the largest third-party publishers. 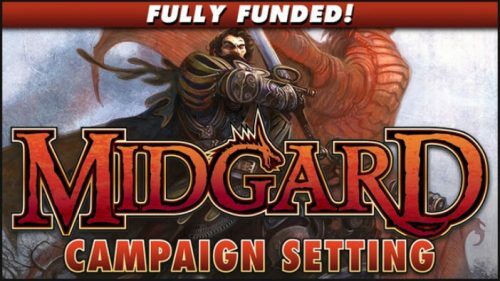 As a bonus, if the campaign reaches 2,000 backers then Kobold Press will make the Midgard setting an open world. What’s an open world? In this case, it’s a RPG setting that you can publish content for (with certain restrictions). 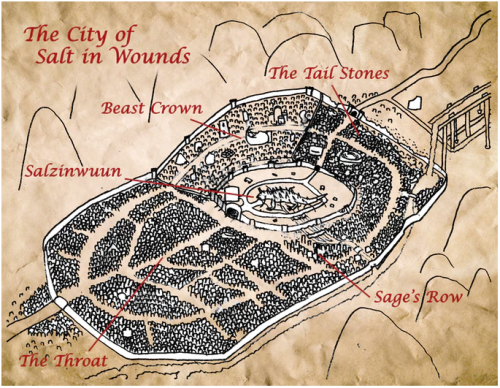 Want to set an adventure and characters in the Midgard’s Ironcrags and publish it for profit? If this stretch goal is achieved, that will be an option. In a perfect kickstarted world, I’d want to playtest as much of Midgard as possible and use that knowledge to create worthwhile new content within the Midgard setting. With every new backer on this project, we’re getting closer to my goal. No vanity-press-buy-a-RPG-creator’s-credit this week. Instead, let’s focus on a publication to improve my RPG adventure module writing skills. Kickstarter campaign ends on Tuesday, February 14th, 2017 at 11:50 PM EST. “Advice on how you can write great adventures – from the company that has published more than 200 top-notch adventures! What we have learned since then is that advice is largely true. Poorly written, uninteresting, uninspired adventure modules do not sell. But the good adventure modules – the exciting ones – that ones that read well and play well at the table – they become treasured memories for us all. They become legends. These adventures are the shared experience that builds our community. We remember our exploits, ask each other how a different group handled that encounter, and lament the secret doors we may have missed. We tell our friends about the climactic finale; we are in turns surprised and devastated and thrilled as we navigate the encounters. 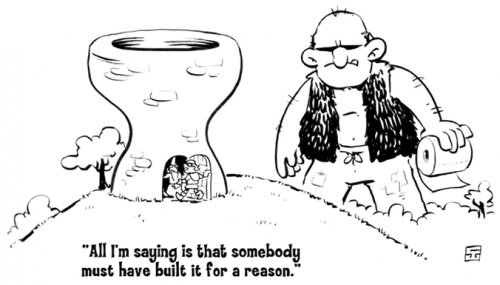 And most importantly, if an adventure is fun to play – if the game master and the players both have a blast – then we tell our friends, and they play, and they tell their friends, and that adventure becomes a community builder. It is played thousands and thousands of times. It becomes a legend. This book is about how to create tabletop RPG adventures that become those legends. This book is about how to write great adventure modules – the ones that gamers can’t stop talking about. I want to be a tabletop role-playing game freelancer. I have some creator credits and experience that I’ve bought through RPG Kickstarters. What I don’t have is a mentor. HtWAMTDS is not that, but it is written by individuals that would be ideal mentors. The book promises to share their thought process for designing modules and adventure paths. The cleverest part of Goodman Game’s Kickstarter is the updates, they’re samples of the book’s philosophy. Unlike so many projects, this one creates a clearer and clearer picture of what you are purchasing every time they add a new post. To be clear, there are no vanity press rewards here. Instead, for as little as $12, you can get the PDF of HtWAMTDS and learn from those that have gone before and made money in this industry. Seems like money well spent. First, what’s a playtester? That’s an individual who puts an unpublished/untested game through its paces. They play and look for successes and flaws and communicate their findings back to the creator for consideration. Second, why do I want to playtest something? Two reasons. Unlike my prior purchases, I’m not buying RPG experience for myself. This time, I’m showing that I have enough experience to improve someone else’s work. This is my journey to freelancer and it starts with selecting the Kickstarter RPG Reward Level: Vanity Press. In October, 2015, Dungeons & Dragons 5e was 15 months into their commercial lifecycle when Kobold Press kickstarted the Tome of Beasts and the Book of Lairs. Why did they create the Tome of Beasts? 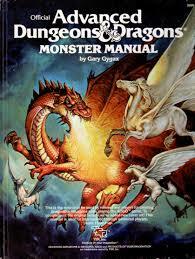 At that time, 5e had a lone official Monster Manual of all the critters to fight. Volo’s Guide to Monsters was unannounced and 13 months away. 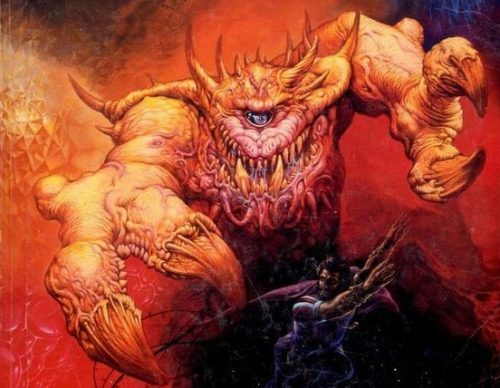 The largest resource for third-party monsters was either homebrew or Frog God Games’ Fifth Edition Foes. 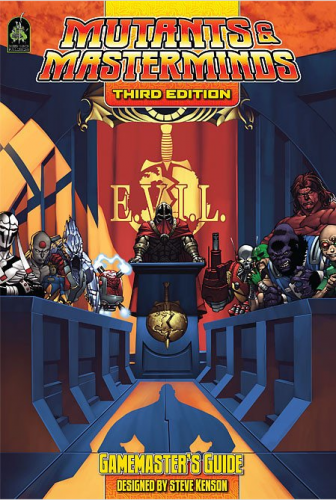 The Fifth Edition Foes had been kickstarted the same month that 5e launched (along with two other 5e books). They generated nearly $64,000, so there was precedent that showed fan demand. 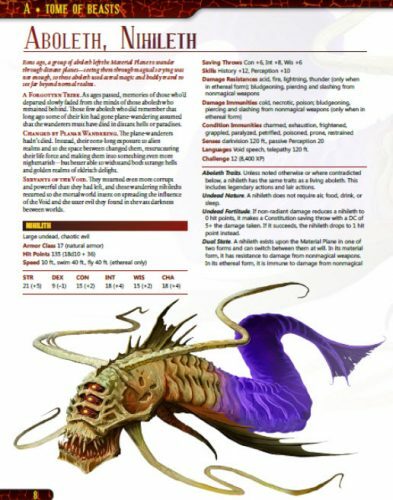 Despite the monster foes, homebrews and various one-offs for 5e, there was a desire for even more monsters. Enter Kobold Press and their offering, the Tome of Beasts. Why did they create the Book of Lairs? 15 months into the commercial existence of 5e, there were a number of official adventure paths but not as many standalone dungeons or monster lairs. Just want a dungeon for your characters to crawl with a hook, monsters, and treasure instead of a whole campaign? Kobold Press‘ Book of Lairs is for you. Let me type a few words on Kobold Press. They are one of the largest 3PPs (third-party publishers) in gamedom. 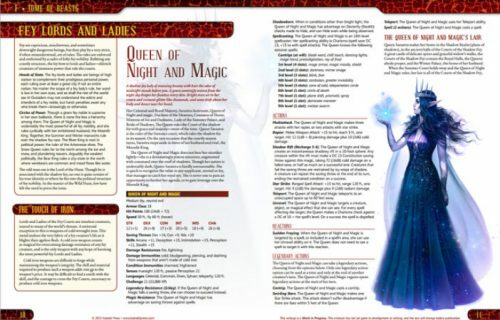 They wrote the first two official hardcover modules for 5e – Hoard of the Dragon Queen and The Rise of Tiamat – and have proven to be a consistently nice group of folks. 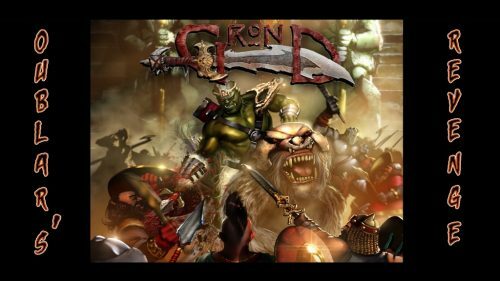 Kobold-in-Chief Wolfgang Baur, hobbylancer Ben McFarland, Kobold Minion Dan Dillon, and more have decades of combined professional RPG experience creating… well, throw a dart at any quality RPG product and chances are someone there had a hand in it. Why Kobold Press is dear to my heart is spelled out in their FAQ. I’m not going to pretend to be an expert but I think – THINK – that they used to crowdfund and, to a degree, crowdsource their products. 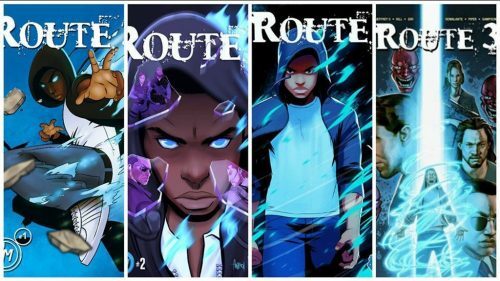 Effectively, kickstart their RPG content the way I blog about before there was a Kickstarter. They were ahead of the curve in a way that foreshadowed what I want to achieve. Their FAQ hints at what I’m hoping to achieve – resume building through patronage. One of the holes in my resume is credited playtester. Is it an important part of your RPG resume? Yes. It shows you have the skills to look at a game that is 90% to 95% of the way to publishable and find that last bit needed to make it shine. Playtester credits “prestige” is ranked by what company or project that you are doing the playtesting for. As I said, Kobold is a large 3PP so I want to have that on my resume. Kobold’s Tome of Beasts offered playtesting and more. For this Kickstarter, I put in $180. What did I get for that? Battlebards Sound Boards – ??? I won for the extra $23.10! I got to playtest several monsters and provide feedback (the results of which I was able to see in the final product… now, whether it was my notes or every reviewer’s thoughts, I don’t know but changes were made). For the Tome, I got to playtest monsters with several friends including John McGuire, Sir Leland Beauchamp, and my fiancee and we are all listed in the book. That’s a moment I reflect on from time-to-time, we got to have fun and put that fun into print. 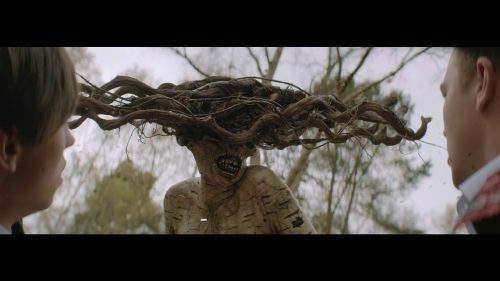 Experience-wise, I got to attend a virtual seminar with Wolfgang Baur and Dan Dillon to hear what makes a great monster and ask questions. With that education, I submitted a beast for their monster submission contest and got professional feedback from Wolfgang. I did not win but Dan gave me his thoughts and it amounted to [paraphrasing] not bad. One of the challenges of buying credits is that the publisher has an obligation to make your submissions, whatever they are, work since you, you know, paid to be in their product. Since you are a customer, feedback from the publishers may be filtered. The monster submission for the Tome of Beasts was a contest open to every backer. Because it’s a contest, they were under no obligation to print my submission. I didn’t win but, based on their feedback, my beast had been in contention for one of the final slots. I lost because others were better, not because mine was awful. To get an unfiltered ‘not bad, not perfect, but not bad’, was encouraging. For $157, I got some amazing 5e products. I get use out of them more often than any other 3PP I own. For $23, I got to provide feedback on a book that has gotten a lot of love, virtually meet the Kobold-in-Chief and Kobold Minion No. Dan (I don’t know his serial number… oy), submit a monster and get useful feedback that helped me to grow as a creator. That was $23 well-spent! For anyone interested, vanity press RPG playtester’s credit number two is available now on Kobold Press’ Midgard Campaign Setting: Dark Roads & Deep Magic. 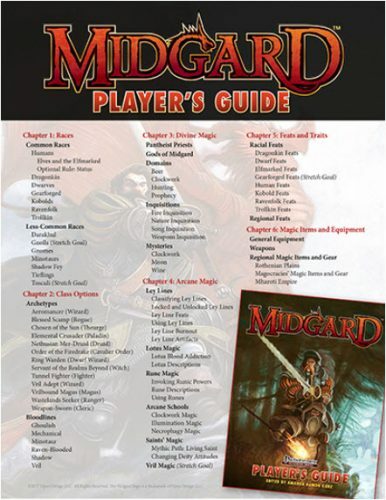 Want to playtest the revised Midgard campaign setting for 5e or Pathfinder? There are a number of pledge levels on this Kickstarter that let you playtest the setting. I’ll delve into the ins and outs of what vanity press options are available through that Kickstarter before it ends on February 24th. In the meantime, I suggest you check it out. To that end, let’s review the RPG vanity rewards of the Kickstarter for The Gods Have Spoken. Kickstarter campaign ends on Tuesday, January 31st, 2017 at 2:11 EDT. 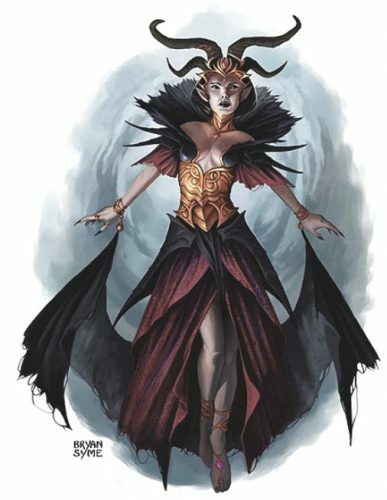 “Twenty-eight new fantasy gods arranged in three new pantheons for your 5E game. New domains and player options that fit the gods. 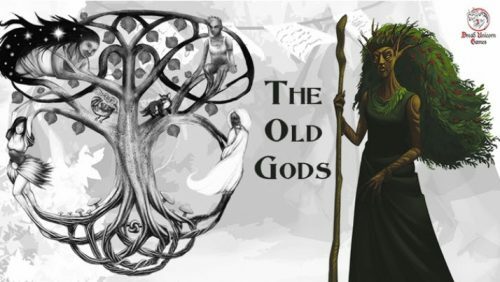 The Gods Have Spoken offers a fresh take on the gods, not just a rehash of the Greco-Roman pantheons, but new pantheons influenced by history and religions from around the world. The followers of the Old Gods were long ago forced out of their lands and into the wild places . Today druids and elves keep the faith alive, while cults of the Old Gods seep back into the teaming cities where once they were banished. The world tree and nature are central to the pantheon. 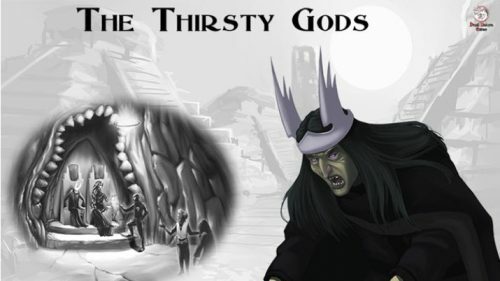 The followers of the pyramid-building Thirsty Gods came across the sea and pushed out the faith of the Old Gods. A warlike people, they too have fallen to more recent invaders. Still the pantheons continues to be followed in many places, including the halls of the dwarves. 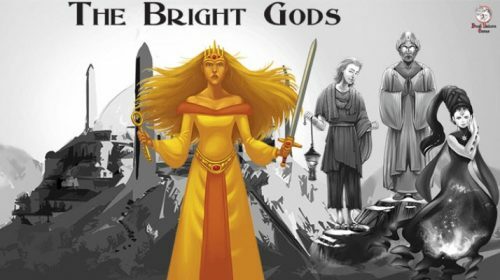 The Bright Gods are worshiped by the newest conquerors of the worlds of men. Their sacred number is three, and the gods of their pantheon are divided into three groups of three. Bits of the older pantheons have been incorporated into the current beliefs and rituals of the Bright Gods. As they stated, these are new options for Dungeons and Dragons gods so there’s a chance to create something integral to the religion. Or a fanatic. Name and describe a magic item of your very own. Use your character’s name if you want to! Binky’s Staff of Clerical Cat Herding? 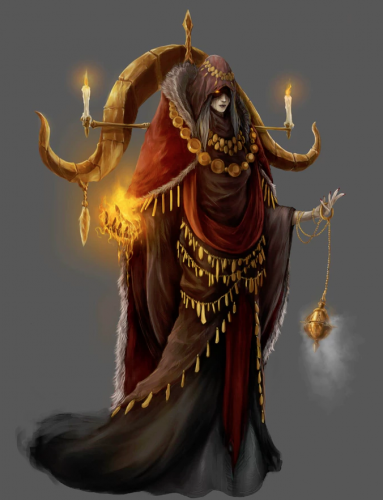 We’ll turn your creation into a balanced magic item for 5th Edition Dungeons and Dragons. Receive a black-and-white soft cover edition of The Gods Have Spoken, a digital color copy of The Gods Have Spoken, and your name will be listed on the book’s Acknowledgements page. This backer level includes all digital stretch goals. Name and describe a saint (or other holy person) for one of the pantheons (or even a saint-without-portfolio) and we’ll add it to The Gods Have Spoken. Name it for your favorite character, pet, and so on. 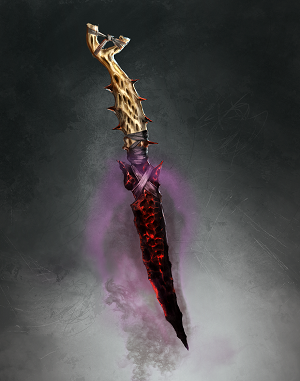 Name and describe a magic item of your own, (as in the Relic Maker backer level). Rarely do you get to build a part of a religion unless you’re the DM. With this, you can think of a cleric, paladin, or druid that will be a featured NPC with their own relic to strengthen their position in the religion. Creating a magic item or an NPC needs to service a setting more than anything. 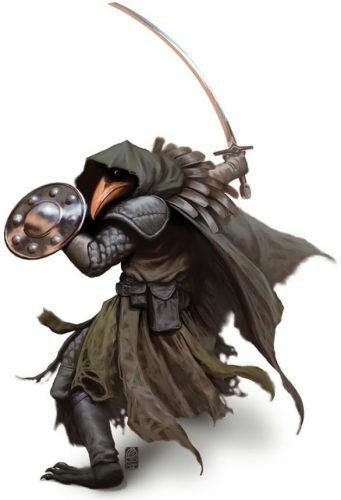 With this pledge, your NPC saint could be someone or something (it’s D&D, why not Saint Beholder?!) that completed a task so important for their goddess/god that they become a linchpin for the religion. This option allows for a cool, directed NPC that advances the religion in whatever campaign it’s added to. Best of all, “Patron Saint of NPCs” looks good on a resume. Happy holidays! Looking for a unique gift for a role-playing gaming fan? How about giving them the opportunity to write for an RPG? On certain RPG Kickstarters, there are vanity press rewards that let you buy the option to create a non-player character that will be immortalized in a RPG product. For a select few, that is the perfect stocking stuffer – the gift of work! Wait… Work? Hmm… That’s like a tax refund… I’m getting my money back! Yippee… sorta… So, this holiday season, the suggestion is to pay to work for a gaming company? Uh, why? Build a resume! My goal in buying RPG writing credits via Kickstarter is to build up my resume and experience to move from a RPG wanna-lancer to a RPG freelancer. Be creative! Do you or a friend have more ideas than time? Here’s a chance to unleash just a taste of that creativity on the world. Be immortalized! …at least until the next edition of the RPG system this product is written for comes out. Tempted? Here’s a possible RPG Kickstarter with some vanity press options to consider. Kickstarter campaign ends on Wednesday, December 28th, 2016 at 15:37 EDT. “An extended adventure module compatible with Fifth Edition, designed for 4-6 characters from level 1 (or more) to 10. The Island is available as a PDF or a full-color hardcover volume of 112 pages and, in addition, you can have a 24″ x 36″ Full Color Map and a Full Color Master Screen, with an innovative system of Initiative management. What is ISLAND OF MOANING VOICES? It is an epic adventure that can engage groups of players for countless sessions and make them grow from level 1 to 10. It is a whole new island of adventure, mystery, exploration, struggle for survival but also political intrigue and dark plots that can unfold and develop further in the, already planned, sequels. You can immediately start to play with the pre-generated characters or use your own, even if they are not novice ones! The Duke may call it Prosperity Island today but, for the inhabitants, it is still old Moaning Voices and it “welcomes” people of all kind and powers! 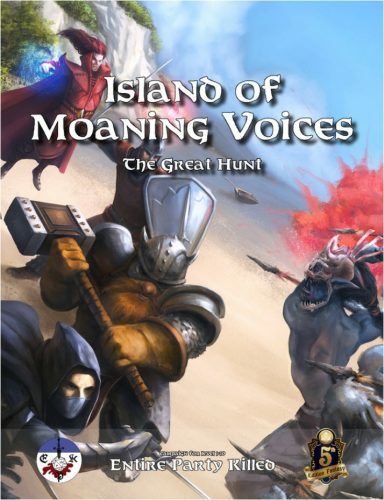 Island of Moaning Voices is a 112 pages sandbox adventure for characters of level 1-10 (or more, in the sequels, if we reach certain PLEDGE GOALS) with rich graphics and original contents, set in an exotic and mysterious island. It’s an OLD SCHOOL flavored setting but in line with the simplicity and flexibility of the 5th EDITION game. In the adventure module, presented both in the inexpensive PDF version and in the elegant hardcover volume, there will be many NEW MONSTERS, CREATURES, SPELLS and MAGIC ITEMS! Moreover, NEW RULES for terrestrial exploration will let the players to use the strategic hexagonal map to discover this fascinating setting. A part for the fantastic locations, there is a surprising story and many plot twists! Island of Moaning Voices represents the frontier for the inhabitants of the rich seafaring Duchy of Belqualam, an only partially explored frontier, definitely wild and fraught with dangers. Furthermore, there is the recent discovery of a precious arcane metal whose properties are still not completely understood. The metal, called “Prosperium” to bring good luck to the beginning community, makes the Island a strategic center for the economy of the Duchy and its military supremacy over the neighboring Kingdom of Halethia. However, the exploitation and colonization of the Island have been particularly difficult. In an effort to clean up the island from the many hostile presences, the Duke thought of gathering there a large number of Adventurers. He has been very successful in this endeavor thanks to a gimmick: since a few years ago, in fact, he organizes the FRAG FEST on the island. It is a month long festival whose main attraction is THE GREAT HUNT, a series of organized events and competitions designed to decimate the population of hostile creatures of Moaning Voices. In addition to Landlord goodies, you can work with us to create a main NPC of Island of Moaning Voices, with his own background, personality and traits. Our artist Domenico Neziti will realize his portrait. Remember, it could be your player character too! 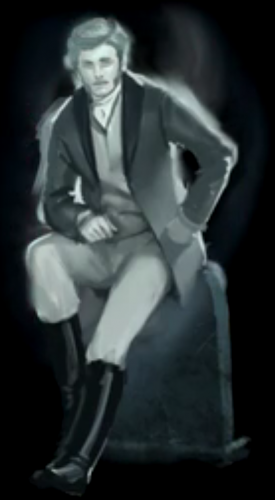 Like Sculptor of Fate but the NPC you created with us will also be central in one of the main events of the plot. You will help us to shape the story, so you will really be the Lord of the Island! Choose the Sculptor of Fate reward to create a NPC and see it illustrated by Domenico Neziti. Do the write up and, with that, you will influence this artist’s work. Alternately, you can choose to be the Lord of the Island and not only write up your NPC and have her/him/it drawn but also help guide the plot of the adventure. Along with all of the print and PDF products, you will have a hand in building this fantasy society and creating a member of that world. With seven days to go, this project still needs to raise 87% of their funding. If you want to create an NPC, back this project. They’ll appreciate the support. If it funds, the world will read your, or if you are giving this as a gift, your friend’s, creativity. Behind the scenes, I’ve made strides in my scheme to buy my way up from RPG wanna-lancer to RPG freelancer. Still working at getting into RPGs professionally, but strides are being made all the same. The root of my plan is buying role-playing game writing credits via Kickstarter to create a resume. Currently, here are some of the Kickstarters that are offering vanity press options. I’ve chronicled the NPC that I created for Ember Design Studios via their Kickstarter for Yrisa’s Nightmare and Rats in the Street. My guildmate, John McGuire, wrote up his experience creating a NPC for the same products here. As it happens, EDS is running another Kickstarter and they’re offering more NPC creation options. Kickstarter campaign ends on Sunday, December 18th, 2016 at 12:00 EDT. “Lost beneath the waves for untold millennia, the Sunken Temple has been seen again. Inspired by the works of HP Lovecraft. 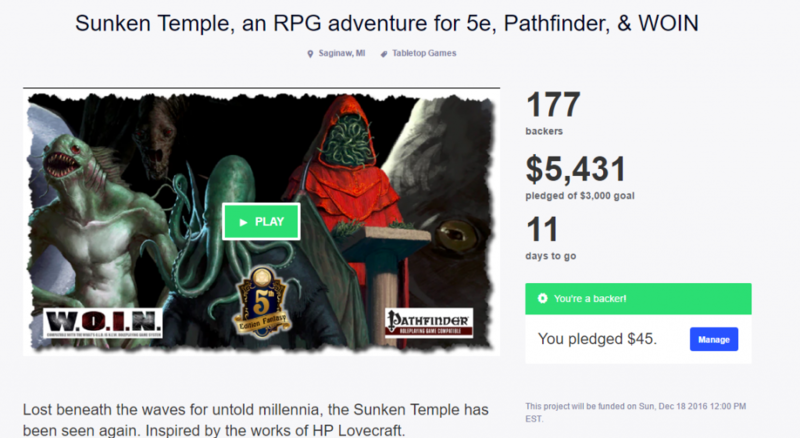 Sunken Temple is an adventure written for 5e, W.O.I.N., and the Pathfinder Roleplaying Game. It takes place in a mysterious range of never-before-seen mountains and is suitable for use in any setting. The module is inspired by the works of H.P. Lovecraft, particularly The Case of Charles Dexter Ward, The Shadow Over Innsmouth, and At the Mountains of Madness. An adventure suitable for 4-5 characters of 6th-level. The playstyle is predominately a dungeon crawl, with a horrific element appropriate to the source material. The temple includes several wings, each with a different feel, assortment of baddies, and their own malevolent purpose – with additional wings ready to be unearthed through stretch goals! Game stats and original artwork for several traditional Lovecraft beasties (deep one, star spawn, night gaunt, and rat thing) and a few originals of my own devising. This project will have versions available for 5e, Pathfinder, and – best for my resume – W.O.I.N. That adds another system to my list. Adding to its draw, this is another project that plays in Cthulhu’s sandbox. For EDS’s last Kickstarter, I created Celltar Drumthunder. It was fun, easy, and formed a part of a set of memorable Christmas gifts as I gave two other NPC creation slots to my buddies, John McGuire and Leland Beauchamp. We tied the back stories of our non-player characters together. For this adventure, EDS is offering two types of NPCs, sailors or more prominent characters (captain, etc). Since this is a similar opportunity as with Yrisa’s Nightmare, let me offer Sunken Temple the highest praise I can give – John McGuire, Leland Beauchamp, and myself are all investing in it and all paying the extra to create more NPCs. The experience was good enough to warrant repeat business. The reason the temple sank – Too many c-thulhu-arbs! With the unlocking of Voyage of the Sea Darter there is a chance for those of you who want to leave a more lasting mark on Sunken Temple to do so. Sea Darter boasts a crew of about 20 sailors. Several of them will have minor roles in the adventure, and the more and diverse personalities that they have, the better. So, if you’d like to take a swing at creating a sailor that will appear in this finished aventure, just add $20 to your pledge. Now, maybe you want to have a more prominent impact both on the project funding and the characters in the adventure. If you’d like to nab one of these slots, add $50 to your pledge and message me, so I know which one you want and make sure we don’t have everyone adding the same ones. For each of these that someone claims, I’ll also commission extra artwork for the character. Kickstarter campaign ends on Sunday, December 18th, 2016 at 11:59 EDT in the evening. “Venture into the ruins of civilization! Fight nuclear fallout and wild warlords! Try to survive and thrive in Earth’s atomic twilight! Pockets of Earth are decimated by nuclear war in 1969 after the Bay of Pigs escalates into World War 3 and atomic weapons are unleashed across the planet. The alter sapiens of the world put aside their differences and use their abilities to create safe havens across the globe, saving those they can from nuclear devastation. Almost a century and a half has passed since the atomic apocalypse and through tireless scientific effort, areas of the world are becoming livable once more and civilization is creeping out to seek out life once again under the sun—though doing so means surviving in the Wasteland and many believe they were better off locked away in their shelters. This setting is an alternate timeline deviating from their main setting which is a variant timeline from our own. The idea of multiple timeline settings presents a campaign idea – learning the origins of these worlds by dimension jumping the PCs from the Hypercorps 2099 timeline/setting to “our” timeline to find out why the altered sapiens and fantasy races never emerged. 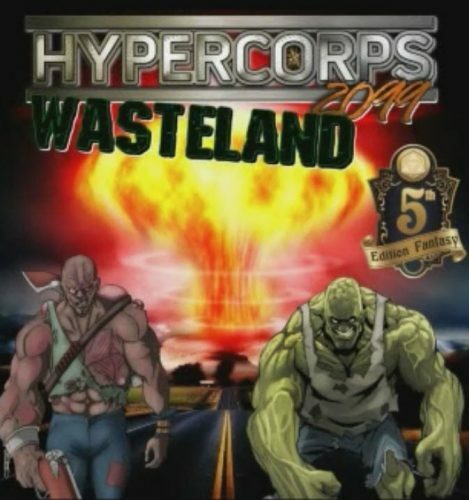 From there, travel to the Cuban Missile Crisis to see the start of Hypercorps 2099: Wastelands before traveling to the “current” wastelands setting. There’s a nice story in seeing the cause and effect of the worlds and how the players can influence it. Add the vanity press post apocalypse Kickstarter rewards and this is a winning setting! Not only do you get to design a wasteland warlord and/or a NPC, you also are involved in the art discussion. You will get some say with the artist on how the character(s) will look which is a nice bonus. Wasteland PDF, Wasteland hardcover, 5 session mini-campaign through Roll20.net for you and four friends, and you will help design and order artwork for one of the warlords in Hypercorps 2099: Wasteland! 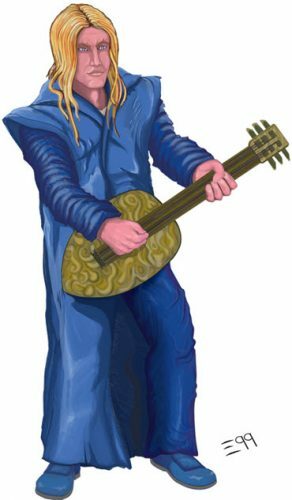 Wasteland PDF, Wasteland hardcover, campaign through Roll20.net for you and four friends (minimum of 10 sessions), and you will help design and order artwork for a unique NPC survivor of your own design and one of the warlords in Hypercorps 2099: Wasteland! Both projects will be fun to see brought to life. 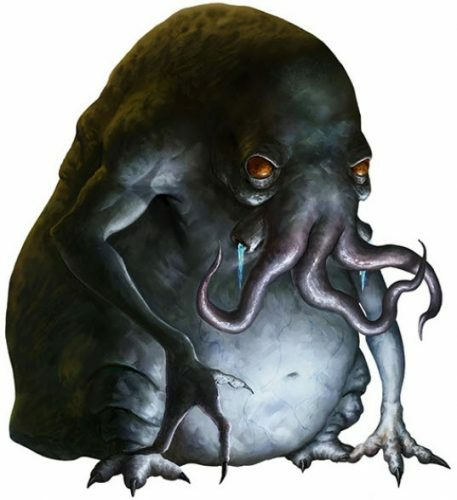 Cthulhu or mutants? Both are going to be fun to fight! I’ve already pledged for EDS’s Sunken Temple. I’ve worked with them before and they are easygoing. I expect a top shelf product with plenty of extras. I’m really excited about this one! And that’s no slight to Mike Myler’s Hypercorps 2099: Wastelands. I believe it will turn out nicely as well. He is presenting an interesting world and solid vanity press options. Both have an extra bit of win, they could be purchased as Christmas gifts for the RPG fan that has it all… save for creator credits. It’s not just my fellow guildmate, Egg Embry, who has dabbled his toes into the Roleplaying Kickstarters. I have kicked in for a couple, here and there. Sometimes it was because of the game, sometimes because of the creators, and sometimes just because. However, it wasn’t until Egg presented me with a fairly unique Christmas present last year that I ever got to participate in the creation side of the process. 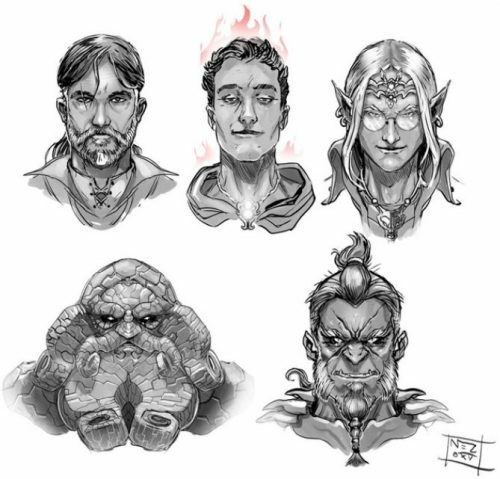 As he alluded to in his post “Kickstarter Reward Level: Vanity Press – Yrisa’s Nightmare and Rats in the Street“, myself, Egg, and our friend Leland all had the opportunity to come up with a trio of characters that would appear in Yrisa’s Nightmare. One of the things you tend to do when you roleplay, no matter the system, is create characters. Obviously you create the ones you are going to actually play, and then after you get them going you think of about 100 more that might be cool to play. I have folders upstairs of all the characters I’ve ever played in a game, but lost to time are the others who might have had backstories or perhaps some were just a collection of stats, never to see the light of day past some random afternoon or evening. I like to think that this bit of daydreaming has come in handy for writing fiction. Novels normally have need of tons of characters – each the hero of their own stories. Perhaps some of those lazy Sunday D&D characters have gone onto a second life within some story without me even realizing it. This was a little different, as this would be a character who needed to “fit” into the world Lucas Curell had created. And while it wasn’t stated anywhere that the three characters needed to be tied to each other, we felt like it might act as a cool Easter Egg for anyone reading the adventure. Egg actually had his character, Celltar Drumthunder, mocked up by the time Leland and I came onboard. Here was a good-looking guy who travels from town to town playing his music wherever he can find a tavern with attentive patrons (or at least the kind who might part with some hard-earned coin). Of course, he repays their kindness by allowing them to invite him into their homes where he generally takes their most valuable of possessions. Through some form of magic, the people only realize it is gone, and not that Celltar might have taken it. A noble who was going to marry a noble woman. He was cursed at their engagement by a thief. Possibly mention he’s hiding from his ex-bride. Cursed a noble at his engagement party. 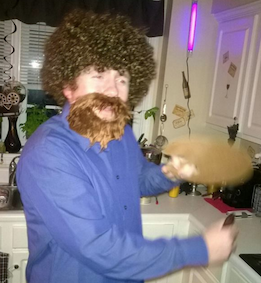 Tried to use a spell to marry a noble woman. First groom was cursed, and they did not marry. Almost wed to a bard who put a spell on her. Rats in the Street. Featuring Wererats. Now there was some concern that these types of connections might not work for Lucas. Perhaps it might be too overt. Maybe it just couldn’t fit in the world he was trying to craft. Heck, maybe we were trying too hard to put our own spin on these characters and doing the “group thing” was not a great idea. Still, we decided to work them up. Worst case, we thought, we could use these characters for something else on our own. The great thing about working with others on any kind of story/character/fiction is that you have someone to bounce ideas off of. People who can see something slightly different from you are able to do. And last, but not least, is that you have built-in editors to help make sure you’re not misspelling every other word. 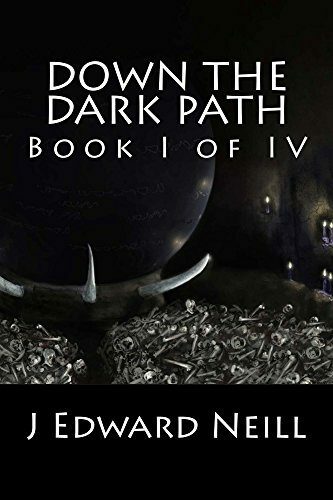 What followed was a series of back and forths among the three of us as we worked up a first draft, then a second, and then a final draft in a format Lucas was looking for. Appearance – This is not only their physical appearance, but also trying to convey some level of insight into their actions. Sully might have been a “lost soul”, but he still held himself in a “regal manner”. Goals – These felt like something which would boil our characters down to their basic instincts. What did they want to do? And maybe how would they get there? To transform into someone they always wished to be. To restore themselves. To get through life as easy as possible. Hobby – This was as simple as “drinking” or losing themselves in research. 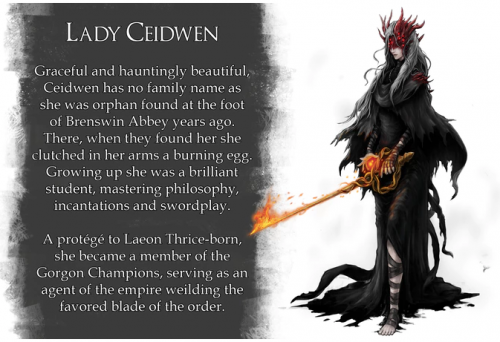 In Yroden (where we lay our tale) – Here was our thoughts on how and why the character might be in Yroden (and thus how they might tie into the actual adventure). This was really the crux of the character and really would determine whether or not the character(s) would end up being used. When Lucas responded he said he loved the interplay between them, but had a twist in mind for using them. Kaiya would actually appear in Yrisa’s Nightmare where the other two would get referenced. 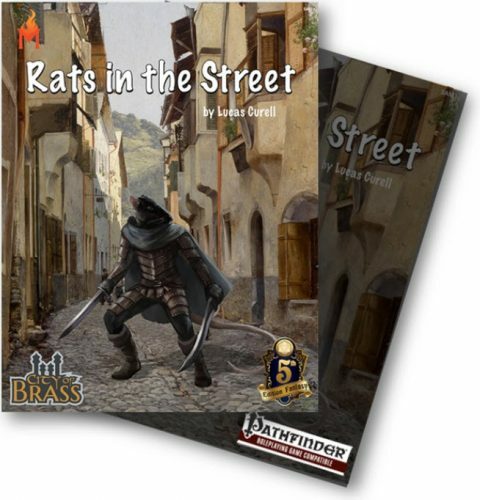 However, Sully and Celltar would get their proper appearance in the companion adventure Rats in the Street – especially since that one featured a gang of wererats. And that, as they say, was that. The characters appeared in their respective stories, and my own hope is that some Game Master out there has not only spotted the connection, but worked it into his own story. Maybe Kaiya is out there helping fight wererats alongside some adventurers. Maybe Celltar has finally found the wrong person to charm. Maybe Sully has found a cure after all. To obtain a job and be successful at it, generally, you need the applicable skills for that profession and you have to prove you possess said skills. I want to move from a role-playing game wanna-lancer to a freelance writer. My proof that I have those skills involves buying writing credits in RPGs via Kickstarter. Stocking my resume with vanity press entries. But if my resume is all vanity press, will that make me a laughing stock instead of someone to take stock in? Before I dive too far into these thoughts, let’s touch on how the Kickstarter vanity press idea works? 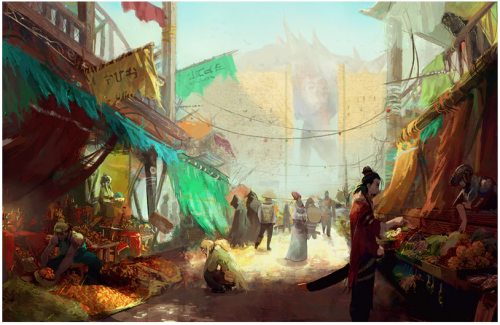 Some RPG Kickstarters offer rewards that let you submit content to their game. They offer an opportunity to write and you pay them for the opportunity. Due to my schedule, this is ideal. It lets me write something with a low word count, typically a few hundred words like an adventure hook, a NPC, a location seed, a monster, or a magic item that will be printed and credited to me. For my first purchase, I participated in Sasquatch Game Studio’s Primeval Thule for 5e where I provided a location seed in their campaign setting. 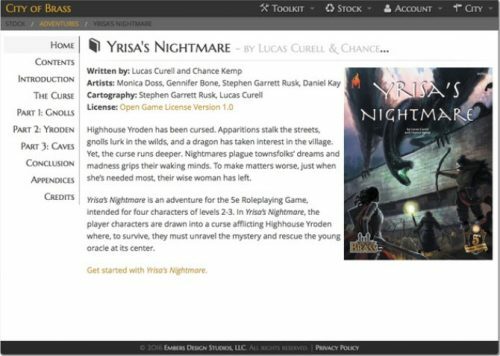 Another opportunity that presented itself was Ember Design Studios’ Kickstarter for Yrisa’s Nightmare and Rats in the Street. Yrisa’s Nightmare is a supernatural mystery set in a viking fort town. Your characters arrive, supernatural attacks happen to them and those around the settlement, and your party either uncovers why these attacks are happening or they don’t get to leave. Ever. Rats in the Street is a city adventure in the same world as Yrisa’s Nightmare. This time, you’re facing a gang of wererat thieves and you have to piece together the clues to stop them. 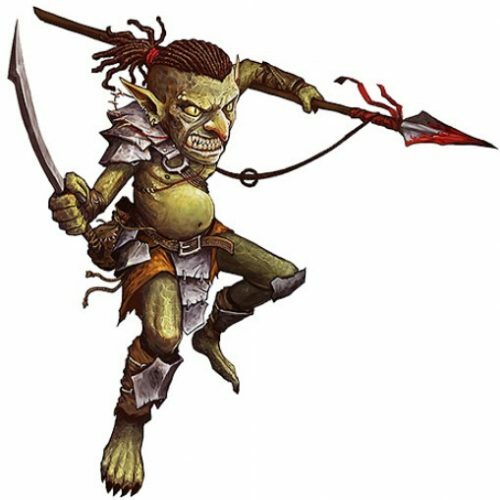 World Builder add-on – “Work with [Lucas Curell] to create an interesting NPC for the village of Yroden or nearby countryside. 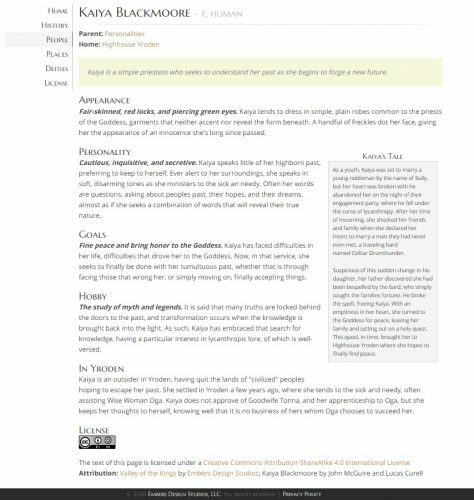 The opportunity to create an NPC expanded my resume from just a location seed to a character. I bought the ability to create three NPCs for Yrisa’s Nightmare. It was just before Christmas 2015 and these seemed like fun gifts for my RPG buddies, John “Cursed Sword” McGuire and Sir Leland Beauchamp. What did we do with three NPCs? We alluded to a shared history through them. For me, this RPG offering yeilded an additional triumph, I drew the picture that accompanies Celltar Drumthunder on the City of Brass and in the Rats in the Street PDF. Lucas picked up on the shared backstory and saw a clever way to use the characters. He put Kaiya Blackmoore as an important NPC in Yrisa’s Nightmare. In that adventure, Sully and Celltar Drumthunder appear as part of the supernatural effects that drive the tale. In Rats in the Street, Sully and Celltar take on some of the larger NPC roles within the adventure. The characters unite these adventures through their shared easter egg (no pun intended) backstory. 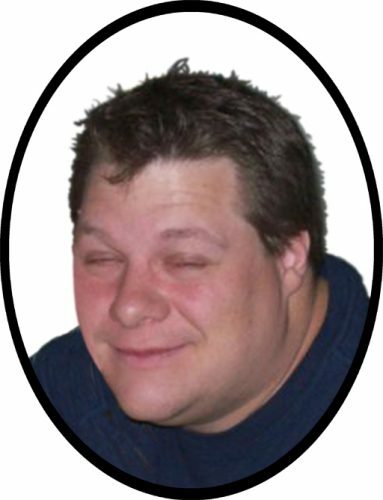 UPDATE – 2016-12-07 – John McGuire did a write up of his character and the process here. To my initial question, will I be taken seriously if my resume is all vanity press Kickstarter rewards? It was a worry. 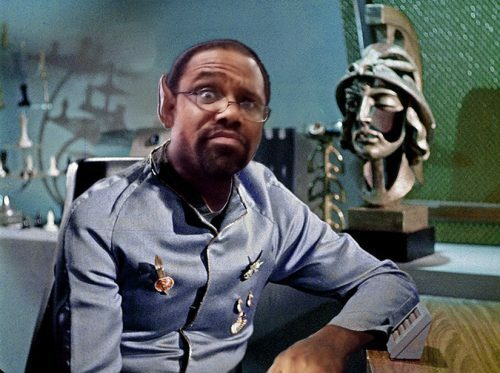 Then Sir Leland* and I went to Gen Con 2016, my first Gen Con. There we had the opportunity to meet Lucas and play through another adventure he created, Bella’s Yarn (5e), another excellent adventure. I really liked playing mideval detective to solve that mystery. For his part, Lucas was awesome. Instead of treating me like a joke because I am trying to buy my way through the door he was happy to talk gaming, and Kickstarters, and RPG websites. He treated me like a welcome addition to the community. It cured my concern. Will I be judged for my start in the industry? Likely. Will that be the end of my quest? No. 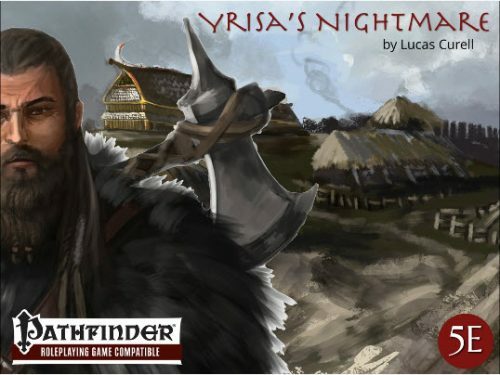 Sample NPCs from Yrisa’s Nightmare. Current State? Role-playing game wanna-lancer. Mission? To become a RPG freelancer. Plan? Pledging for writing credits in other creator’s RPG Kickstarters. From The Faerie Ring by Zombie Sky Press. That’s the situation now, but what about the past? Are there any un-mined RPG writing credits in Kickstarter’s long tail of products? As it turns out, yes. This Kickstarter is in the rearview having started on November 30th of two thousand and fifteen. “The Faerie Ring expands the fey options for both players and GMs using either Pathfinder Roleplaying Game or 5E and creates new opportunities for meddling where you probably shouldn’t. 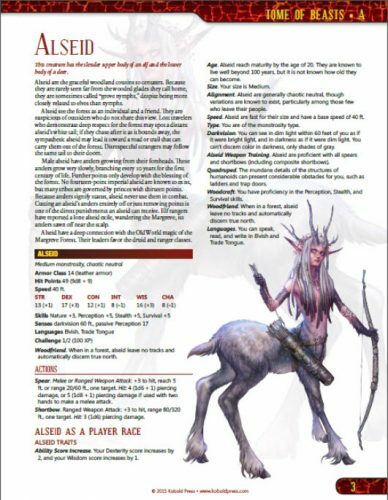 It introduces new fey monsters, playable fey races and other character options, fey big bads or patrons (or both! ), fey cities and planes and other locales, and more. This picture encapsulates the wanna-lancer to freelancer journey. From The Faerie Ring by Zombie Sky Press. We’re updating and remastering the two existing PDF releases (“Prelude” and “Red Jack”) and incorporating them along with nine additional chapters of brand new content as The Faerie Ring: Along the Twisting Way in two printed volumes: a Campaign Guide and a Player’s Guide. Plus, a third book in PDF, the Magic Guide. Not out of intention, but every RPG game I’ve played has been set in a human-centric world. 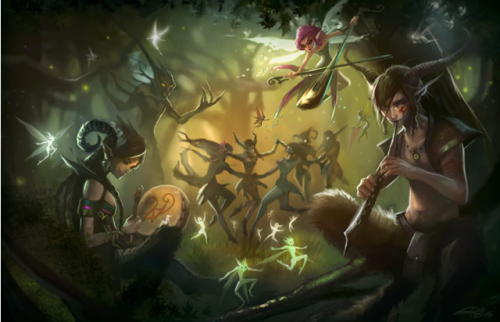 The concept of the fey fleshed out to be more than the occasional antagonist is interesting. This product seems likely to offer both the flavor and crunch needed to make the faerie races, monsters, magics, and societies feel grounded and workable. Had there been a vanity press option, I’d have happily put in my coin. But, a year later, there is an option. As we pull together the Campaign and Player’s Guides for The Faerie Ring, we’re thinking more and more about the Magic Guide. So we’re calling for magical pitches. Interested in submitting something for consideration? Accepted pitches will be commissioned at 5 c/w. For design contributions, please put together a pitch of one or more ideas for the Magic Guide that you’d be interested in working on. We are certainly looking for individual spells and rituals—and I’ll be asking for those at a later date—but we’re currently looking for other things, like fascinating optional subsystems related to magic and the fey. For the pitch, give me a description of what you’re proposing and the presumed word count (assume you can’t have more than 2,000-3,000 words per idea, though great pitches may be given more room). These can be for either 5E or Pathfinder (if accepted, we’ll convert if possible), or maybe, they’re largely flavor with minimal to no crunch; let us know in the pitch. Send pitches to scott(at)zombieskypress(dot)com by December 1, 2016. Kuato Lives! From The Faerie Ring by Zombie Sky Press. 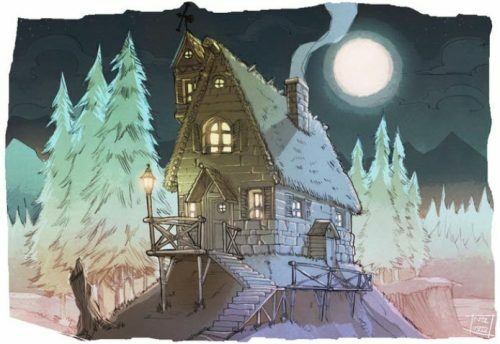 For example, the concept of the moonshadow will be a part of the Magic Guide. This will detail how the moon’s passing affects different fey in different ways (but all fey feel the effects of the moon in some way). To this point, there has been safety in paying for the opportunity to write. Once they have my money they can’t fire me without a refund. What Zombie Sky Press is offering is work-for-hire. Submitting to write comes with no guarantee of acceptance like a Kickstarter pledge does. This situation requires skills not born of my bank account. They’re offering the first major test in my mission: Have I reached the level (oy) where I can move from paying to write to being paid to write? Am I ready to jump from wanna-lancer to freelancer? My journey from tabletop role-playing game wanna-lancer to freelancer involves buying into the right projects (chronicled here). To build my vanity press resume, I review a number Kickstarters. Here’s a few standout projects with vanity press options. Kickstarter campaign ends on Wednesday, October 26th, 2016 at 9:06 EDT in the evening. “Manastorm is a new campaign setting set on a planet located in the Milky Way galaxy. 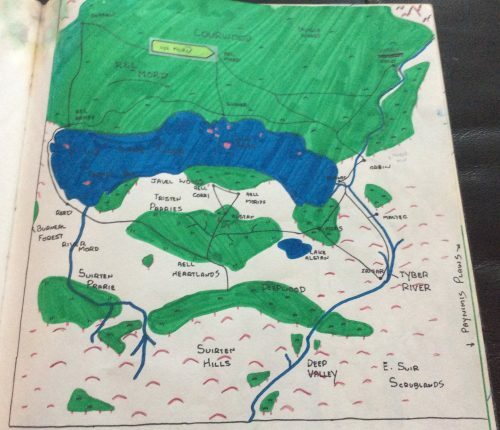 Shin’ar is a world of high magic and epic fantasy! Manastorm is the inaugural product offering from Terran Empire Publishing. It is a new Pathfinder Compatible campaign setting featuring 16 new playable races – each with their own hybrid class – and 6 new prestige classes. The planet of Shin’ar boasts 10 expansive regions to explore, from dust- choked ruins to far off enclaves guarded by logic driven automatons. Manastorm introduces players to the Manasphere, a bubble of radiation that surrounds the planet, given off by mana crystals found deep within the planet’s interior. The Manasphere allows those who can tap into it’s unlimited power to fuel fantastic feats of magic and wonder. Players will be able to create new magical items from mana crystals that allow the user to cast stored spells on themselves or others, as well as allow spellcasters to renew spent spell slots. Players must be warned though, the overuse of mana crystals can result in Mana Poisoning, and eventual death and rising as a Mana Zombie. The planet suffers from events known as Lunar Quickenings. The Dri-jen moon, the smallest of the planet’s two moons, has an erratic orbit. When it moves close enough to the planet, the moon causes all mana crystal deposits within the planet to react wildly. Bursts of raw mana saturate the Manasphere and cause fluctuations in its behavior. During these times, portals to unknown planets and planes of existence spontaneously open all over the world, depositing countless people and creatures on Shin’ar. The vast majority of the peoples encountered on Shin’ar are not native to the planet. Many races have migrated to the world during Lunar Quickenings and found themselves stranded when the event ended. Portals to others dimensions or planets can only function during Lunar Quickenings. The Manasphere does not allow the opening of gates or portals outside of Lunar Quickenings, and it has a way to punish those who try to circumvent this. These events last for an indeterminate amount of time. Some have come and gone in the span of a few years, while some can last over a millennium. 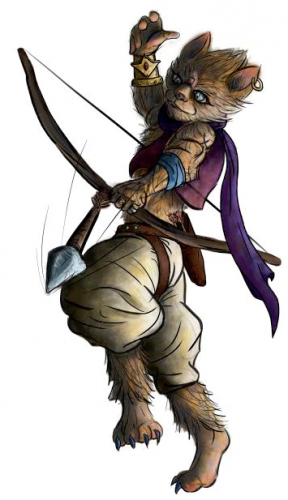 Lunar Quickenings allow GMs and players to include all kinds of “homebrew” races and monsters. While Manastorm will offer more than enough to begin to play wonderful and exciting adventures and campaigns, the Lunar Quickenings make it so anything and everything can be encountered on Shin’ar. Terran Empire will also be hosting competitions to include new races and monsters from fans into future products. This patchwork world is purpose built to seamlessly port your homebrew Pathfinder lands/creatures into. Add to that, this third party Pathfinder campaign setting feels ready-made to upvert for Paizo’s upcoming Starfinder system/setting (2017), it is like you’re getting two products in one. While not written in their pitch, this setting recalls the best of DC comics’ Adam Strange and his Zeta-Beam trips from Earth to save the planet Rann. For me, Manastorm screams unabashed sword and jetpack barbarian-fi! 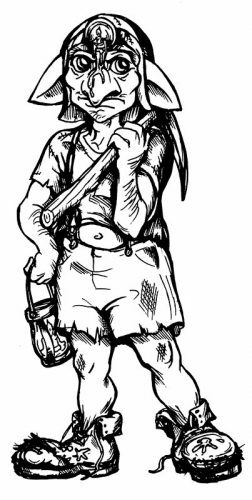 Their vanity press rewards offer a little extra vanity, not only do you get to write an NPC for their product line, but for $35 more they’ll draw the NPC. I’m likely to request a character modeled on great American novelist, John McGuire. Reward – Same as Most Learned plus more! Kickstarter campaign ends on Sunday, October 23rd, 2016 at 9:00 EDT in the evening. “Discover the forsaken. A systemless, soulsian-inspired book of NPCs and creatures to take your games into dark new worlds. All backers, who receive a PDF or more, will receive two free PDF statbooks of their system of choice. Any additional statbook will be a $5 add-on. Systems so far supported: D&D 5th Edition, Pathfinder, Shadow of the Demon Lord, OSR/AD&D, Cypher System, Dungeon World, FATE, Savage Worlds & 13th Age. A systemless offering, this product requires AAA writing to stand next to its epic-level artwork. The art is the selling point for this project. Based on its quality, I believe that the final product will look exceptional. If you’re writing for it, you’ve got to rise to breathtaking prose to go next to these portraits. Each project brings interesting art options. I am intrigued by both. Getting a chance to design within Pathfinder for Manastorm would expand my work into a system beyond 5e (albeit a related system). Going systemless will remove the “crutch” of rules all together and require a focus on creativity to match the art of the Embers of the Forgotten Kingdom. I pledged Manastorm. Getting to design a character to appear in a third party Pathfinder product, with a hoped-for conversion to the upcoming Starfinder, AND getting original art in the deal, it’s a winner and the right choice for lil’ Egg Embry. As far as gift-hauls go, 1987 was a reasonable year. I raked in some fresh NES games, unwrapped a new pile of GI Joe action figures, and rolled my eyes at the requisite stack of clothes for school. I would’ve been satisfied if that’s all it had been. Toys, games, and clothes…what more could an eleven-year old want? And then my Uncle John rolled into town. You see, I lived in Chicago with my grandparents at the time, and the snows that winter were brutal, particularly that night. We’re talking piles of white powder in the yard and dirty grey slush on every road. We’re talking fifteen hours of night, and no real breaks in the clouds for weeks. Uncle John had to commute all the way from downstate, which normally takes two hours, but that night it took him pretty much triple the time. Either it was the snow’s fault, or he dreaded Christmas Eve at my grandparents’ house. I guess I’ll never really know for sure. The hour was late. Ok, maybe not that late, but late for an eleven-year old who’d just spent the entire day begging his grandparents, aunts, and uncles to unwrap a few of all his gifts early. Having succeeded at tormenting them into a massive gift-release, I sat in my bedroom, surrounded by wrapping paper and happiness, content with my life. I could’ve died a happy child right then and there, drowning in a sea of blue inter-connectable racetracks, NES cartridges, tiny plastic rocket launchers, and socks. But I didn’t die. I heard a summons from the living room, and out I shambled. If I was slow, it’s because my belly was stuffed with Circus Peanuts and Orange Crush. I was sleepy. I was dragging. I just wanted to be left alone for the next three months to fully soak up my gift-haul. “Jeremy, your Uncle John has one last gift for you. Do you want to open it tonight?” I remember someone asking me. I halted. Of course I do! 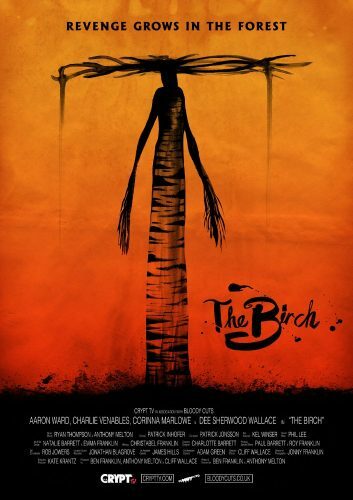 I screamed in my head-movie. “Yeah ok,” I grunted in real life. Uncle John handed me a wide, flat box. You know the ones. I think it was from Macy’s, and it had all the hallmark signs of being another box full of clothes. It wasn’t gift-wrapped, but it did have a single red bow on top. One. Red. Bow. Uncle John wasn’t a sentimental dude, which I could (and still do) understand. When I took the box, I had the same sinking feeling every kid does when he sees a box like that. I thanked him and padded back into the hallway. No one thought much of my departure. I wasn’t two steps away before all the adults (I was the only kid in the house) started talking politics again. Not even Uncle John seemed fazed by my apparent disinterest. Untended to, I plunked down in my bedroom doorway, sighed with all the weight an eleven-year old could muster, and pried the top off the box. I guess I should’ve realized the box was too heavy to be full of clothes. And I should’ve known my Uncle John was too cool for sweaters and school shirts. Before that instant, I’d never heard of Dungeons & Dragons. I’d never heard about role-playing, tabletop gaming, or rolling dice to kill undead lich lords. 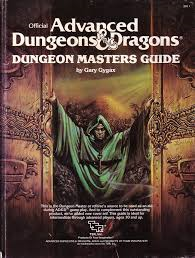 As I picked up the first tome (the Dungeon Master’s guide was my favorite) I felt as if a sharp breeze blew away the memory of all my other gifts. It stunned me, and made me shiver both literally and figuratively. Also in the box: a set of sparkly green polyhedral dice (which my players would learn to hate) and a stack of PC stat sheets, but I didn’t yet comprehend their meaning. I couldn’t see it yet. I was lost, but in a good way. Winter deepened. Chicago frosted over for most of the next three months. I didn’t care. Even though I lacked local friends to game with or a real understanding of what I was getting into, I consumed the books Uncle John had bought me. When I say ‘consumed’ I don’t mean to imply I merely read them a few times. No…I memorized them. I gobbled up the D&D dialect, became a master at its mechanics, and plotted for the day I’d actually be able to run a campaign. But more than this, more than just learning the game, I felt a door open inside my mind. I’d always had a vivid imagination, but this was something different. It changed my perspective about what creativity could be. And in doing so, it changed the course of my life in a very real way. Let’s fast forward a few years. Far removed from frosty Chicago, I found myself in a hot, heavily-wooded part of North Georgia. My parental unit had remarried and shipped us to the deep south, where summers were forever and winters were but a few weeks of rain in late January. I missed the frozen wastes, but thawing out felt nice. And more than the weather were the chances to meet new friends. Friends who would game with me. Friends who shared my passion for deep, dark storytelling. …friends who would fight this guy with me. And so it began. In eight grade, I met The Kube, a friend who was willing to spend endless hours rolling dice with me. He created the legendary characters Silverleaf, Black Dragon, and the wizard who became a prime character in my epic fantasy series, Dank. Then in my freshman year in high school, I met Egg, John McGuire, and the devious Chris Griner. We spent thousands of hours role-playing. We downed hundreds of pizzas, killed barrels of Mountain Dew, and endured sessions lasting upwards of 15 hours. My players learned to hate my dice, but I like to think (in my head-movie) they enjoyed the fact our games were about more than slaughtering imaginary monsters. We told stories. Deep stories about sacrifice and suffering. 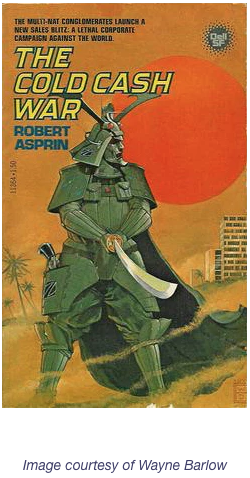 Legendary stuff that no video game can capture, that not even the longest, most profound novel can duplicate. If you’ve ever played our style of ‘storytelling’ D&D, you know what I mean. The players are a part of an epic tale, not just dice-rolling treasure fiends. 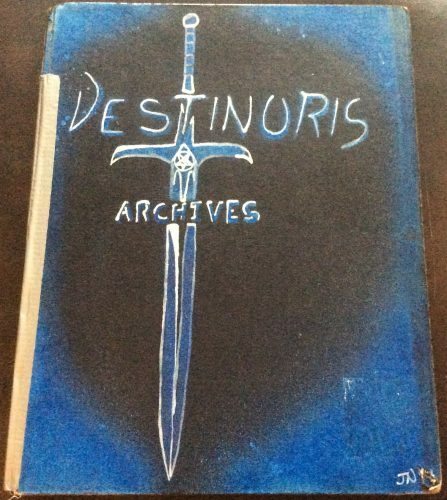 The dungeon master is merely a blank page, ready to turn whichever direction the players want to go. Many years after my last epic session, sometime in the early 2000’s, all the storytelling lessons I’d learned flashed back into my mind. I missed (desperately) the feeling of sitting down with friends to weave a deep, dark tale, but I knew at the same time I probably wasn’t ever going to recapture it. We’d all moved apart and built our own lives. Some of us were married, and others were exploring new careers. Lacking a way to play the game I loved, I had to find a new outlet for my unbridled creativity. And so I started my writing journey. I sat down in the dark, my brain brimming with an entire childhood’s worth of ideas. And the stories, many of them birthed a decade or more earlier, began to pour out of my fingertips. Over the next fifteen years, I wrote fantasy novels, sci-fi tales, spooky novellas, and other fictional fare. I couldn’t stop. I was (and still am) a man possessed. Looking back at all of it, I know I never would’ve done it if not for those endless nights of dice-rolling and gold piece counting. I might’ve done other creative stuff, but the depth wouldn’t have been there. The story-telling skills I learned during a decade of D&D’ing were irreplaceable stuff. The seed had been planted on Christmas Eve 1987, and had grown into something I never could’ve anticipated. Those three little books changed the way I thought. The way I imagined. The way I wanted to create. And after thousands of dice rolls, hundreds of hours spent preparing stories for my players, and countless nights at the gaming table, I wasn’t the same person I’d been. I’d grown to appreciate the art of a story without an end, and I’d learned to love all the crazy thought-collisions that happened while playing this simple little game. There are those who will mock D&D. They’ll say it’s a game for nerds, introverts, maybe even losers. Some will even claim it supports anti-social, anti-religious behavior. Nonsense…all of it. Done right, D&D is a vehicle for allowing people to take part in a story. It’s better than TV, which isn’t interactive. It’s better than video games, which confines players to a controller and some pixels. In many ways, it’s the most imaginative game ever created. It was for me. And I’m willing to bet, it was for many, many others. So here’s to The Kube, Egg, Griner, Nicky P, Jeremy II, John, and all the rest. These fine friends were inspirers of more characters than I can recollect. 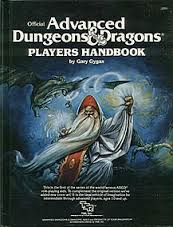 AD&D First Edition forever! And here’s to Uncle John. He gave me three little books that rocked my world. …and inspired twenty-four books of my own…and counting. Published in 2015….conceived in 1992. Take your kids’ phones away. Give them a D&D book. And walk away. My goal? To write tabletop role-playing games professionally. My plan? To pledge for RPG Kickstarters that let me write as a reward. My reality? I pay-to-play to build my resume. 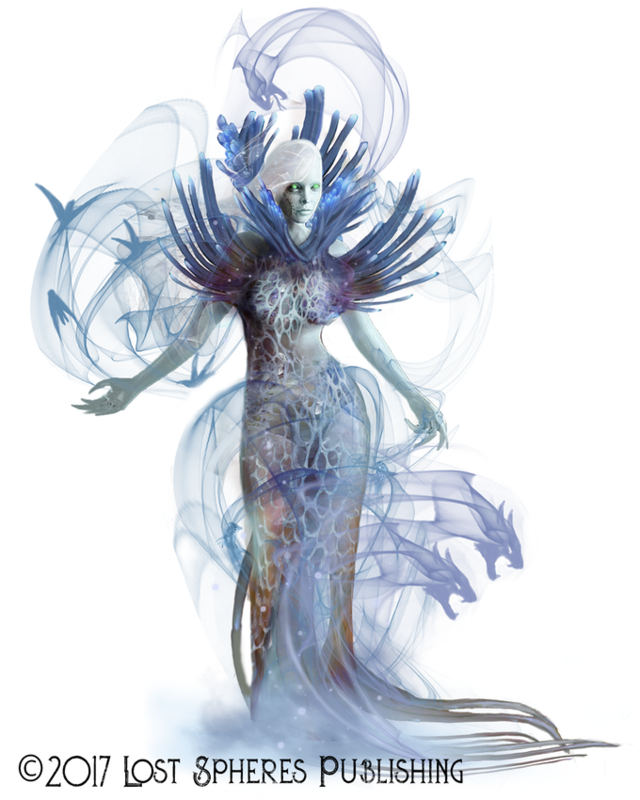 So far, I discussed my contribution – monetary and writing-wise – to the Kickstarter for Sasquatch Game Studio’s 5e campaign setting on Kickstarter Reward Level: Vanity Press – Primeval Thule. If my path inspires you to do the same – buy writing credits – then here are some of the RPG vanity press rewards currently on Kickstarter. Kickstarter campaign ends on Friday, September 30th, 2016 at 11:07 EDT in the morning. “Luminous Echo is a world containing ten years’ worth of lore, characters, artifacts, and amazing weapons by world renowned artist Wen-M.
One world, forever divided into two realms. The Dream World, a realm of magic, immortality, and mysteries. Mhodica, a realm of solid matter, stone, and certainties. For as long as either realm could remember, they were precious little more than myth to each other. Though once stories of witches, wizards, ghosts and goblins were considered nothing more than stories to frighten small children, the age of certainty is coming to an end. A darkness is stirring which threatens to shatter the equilibrium of the two realms forever. The only way to avert this catastrophe is for the people of Mhodica to accept the existence of magic, and for the people of the Dream World to accept that the world of Mhodica exists for something more than their own amusement. Luminous Echo is half art book showcasing the work of Wen-M and half an outline of the world, as well as many characters, weapons, stories, and places. Why would you want to be in this book? It’s so pretty! So, so pretty! You will be happy with the words but even happier with the art! A huge incentive to pledge for their vanity press option is that Wen-M, this project’s artist, will draw a picture of what you write about and you get to keep the sketch. Need another perk? 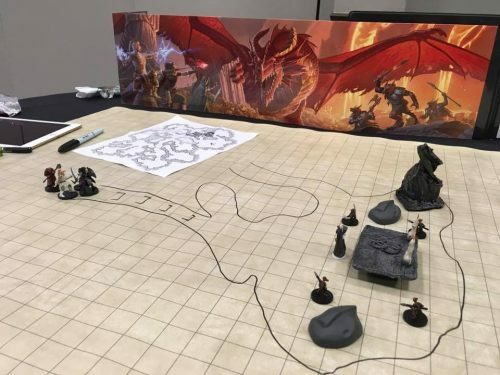 It will be available for D&D 5e, Pathfinder, and Anima gaming systems. More systems = more exposure. You will receive all rewards in the “Signed Book and All Printouts” tier + custom designed weapon in full color with short story in the book, with the signed original sketch from Wen-M.
You will receive all rewards in the “Signed Book and All Printouts” tier + custom designed creature in full color with short story in the book, with the signed original sketch from Wen-M.
You will receive all rewards in the “Signed Book and All Printouts” tier + custom designed hero in full color with short story in the book, with the signed original sketch from Wen-M.
You will receive all rewards in the “Signed Book and All Printouts” tier Build your landmark in the setting with this custom designed clan with a Clan Emblem of your design, and up to 5 characters with their stories in the book! Kickstarter campaign ends on Sunday, September 25th, 2016 at 5:11 EDT in the morning. 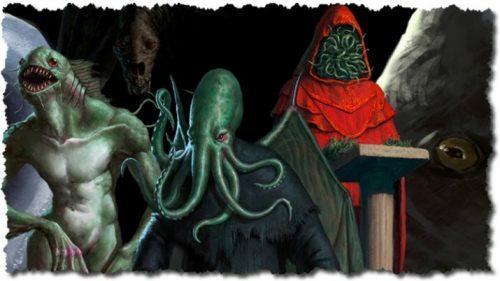 “Author William “Mindflayer” Tucker (Kenzer and Co.), brings his brand of danger to TPK Games in the form of two great adventures. Two Dark Fantasy Adventures, Two Great Systems, Just in Time for Halloween! We are looking for your support to help us publish two great dark fantasy 64-page adventures for the Pathfinder and 5e Dungeons & Dragons games. We love both systems and will be dual-statting the adventures so no matter which is your favorite, we’ll have you covered. Your investment will help us bring more art and layout to the project. Two modules for D&D 5e and Pathfinder. 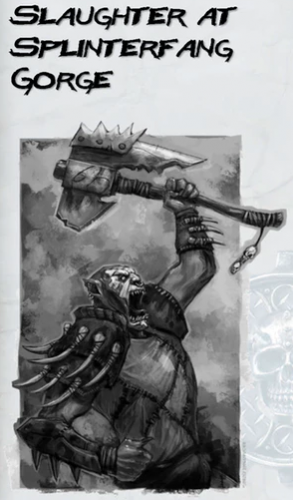 The main one is all sorts of bugbear goodness! Can’t go wrong with bugbears! This Kickstarter campaign does not have a vanity press option. However, it does have four print advertisement pages. The reward offers ad space for your gaming-related project. With four days to go, they had all four print ad pages left so I took a chance and contacted Brian Berg (Slaughter at’s co-creator). I asked if I could take one of those four print pages for $100 and, instead of submitting an ad, submit a monster or magic item or whatever would fit into their module. He said yes. That made my day! Both of these projects are going to be fun. 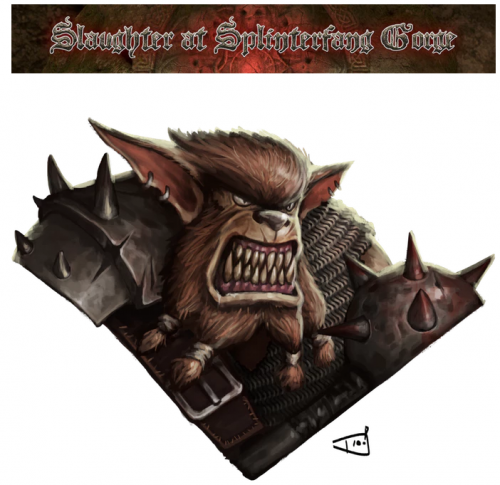 I’ve already pledged for Slaughter at Splinterfang Gorge and will document what comes of the pledge in the months to come. Review them both with a thought toward your name on the credit’s page. Since my first game of D&D with J Edward Neill, I’ve seen tabletop role-playing games as an opportunity to tell stories professionally. J Edward Neill was my first DM. Honest. However, it’s not a profession that I pursued. I plead “responsibilities” – day job of nearing two decades, kids, over a decade into my mortgage, excessive comic book and TV consumption, you know the chorus to this song. I have not made time to create, to move from wanna-lancer to freelancer. The writing is nothing too intensive, nothing that eats time. An adventure hook, a NPC, a location seed, a monster, or a magic item, just a few hundred words – my words, my name in the credits. This is my journey to freelancer and it starts with selecting the Kickstarter Reward Level: Vanity Press. 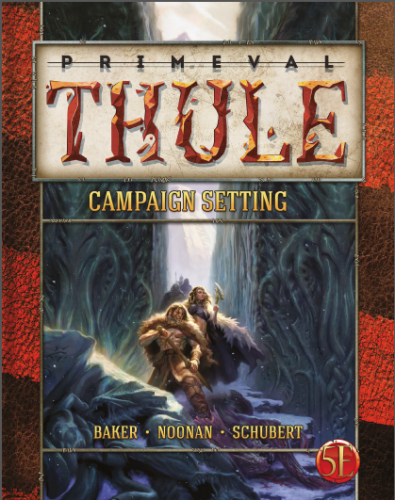 Primeval Thule is a Conan versus Cthulhu inspired campaign setting for Dungeons & Dragons 5th edition. 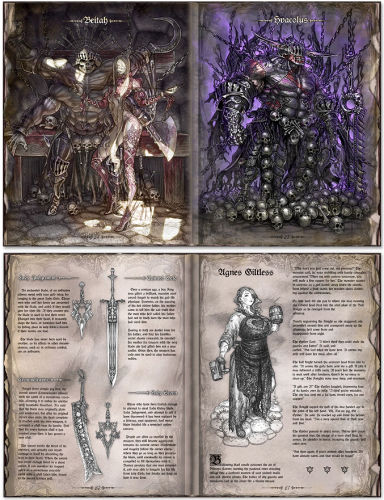 Created by Richard Baker, David Noonan, and Stephen Schubert of Sasquatch Game Studio, they have written for D&D 3e, 4e, and – their most relevant product to this Kickstarter – Princes of the Apocalypse for 5e. Interested in a free sample of Primeval Thule? Try Primeval Thule Traveler’s Guide to get a taste of their world. This image from Primeval Thule page 126 pops for me! Their reward – pay-to-play or, for my situation in the era of credit cards, swipe-to-write – fit my time budget and my love of D&D. Combined with Thule’s barbarian-nightmare setting, their first-rate production values, and, top of my Christmas wish list, my words and name in print, I saw a path to freelancing with Primevel Thule as the first step.